I went down to central market really late yesterday. I don’t really like going later in the day because a lot of the items I want are sold out. However, sometimes going late pays off and you get a bunch of good deals. 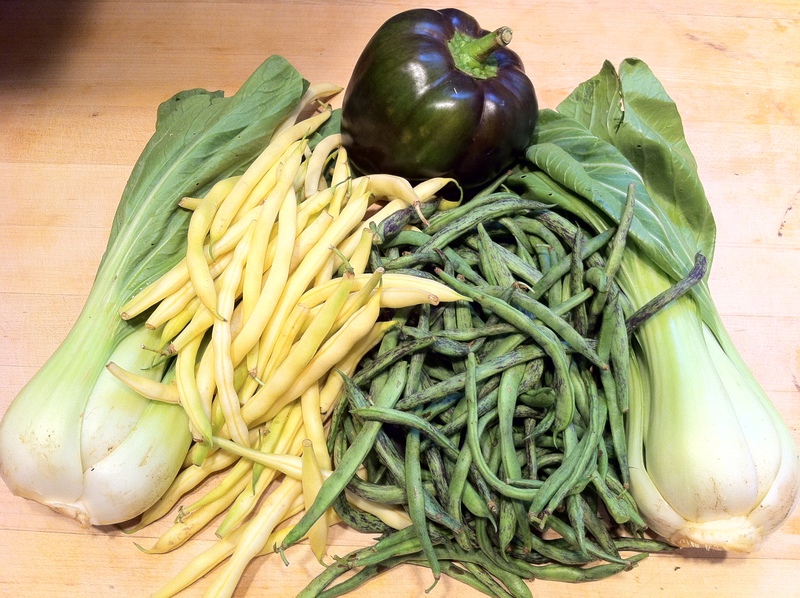 Some of the vendors will throw a few extra veggies in your market bag because they want to get rid of things before they pack up and head home. You often get half price bread if there is a lot left and it is nearing 2pm. You can talk to the stand holders a little bit longer because they are not as busy. I guess it is pretty nice and relaxing to show up late sometimes. Yesterday was dreary and rainy so there was still a lot left at market by the time I arrived. Hurricane Irene was moving up the coast and I think many of the regular market goers stayed in. I did notice a surprising amount of hustle and bustle in the market area even though it was pouring outside. Millersville University has been bringing their new freshman class into the city the weekend before school begins for the past two years. There were MU tour groups entering and leaving market getting a glimpse of downtown Lancaster. I enjoy seeing them out in the city. I actually really wish they brought me in to town when I first arrived at Millersville. It took me a while before I discovered the greatness of downtown Lancaster. Venturing out of campus wasn’t really encouraged or advertised when I attended school as an undergrad. I’m happy they are making more of an effort to introduce new people to downtown. 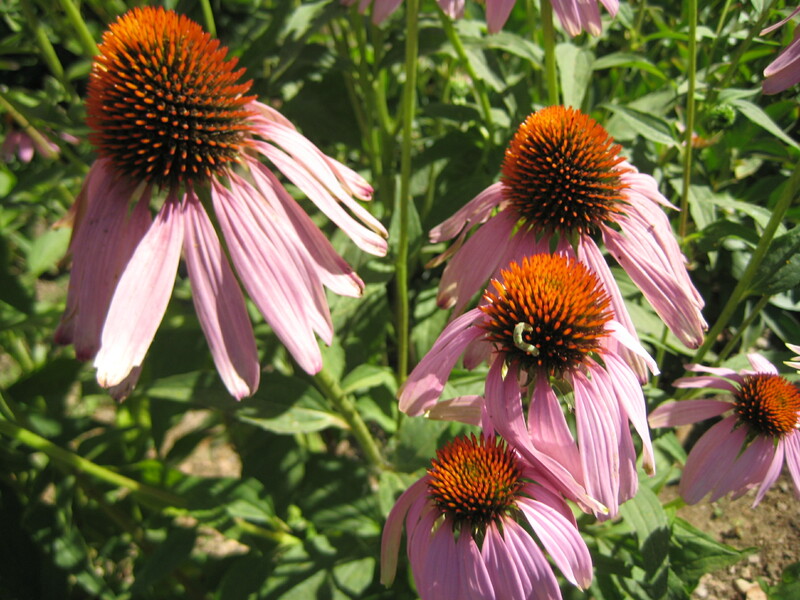 It is a great place to visit and spend your time. I like it so much I decided to call it home. I was really pleased with my shopping trip. I didn’t buy a ton of stuff but I went home feeling like I got a great amount of veggies for a great price. I feel like that every week when I buy lemons and limes that are 3 for $1.00 and then I see then in the grocery store at crazy prices, like lemons for $.89 each! 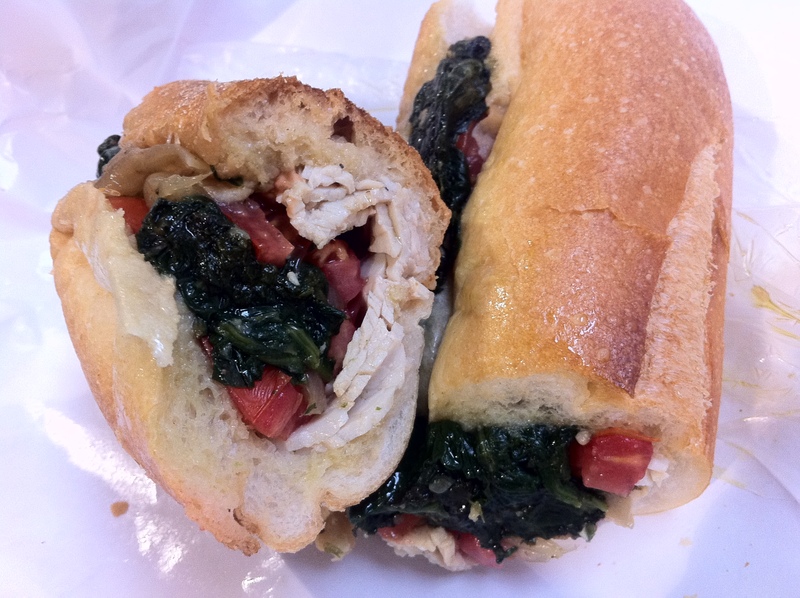 I decided to have a sandwich for lunch from Delgiorno’s Italian Specialties. 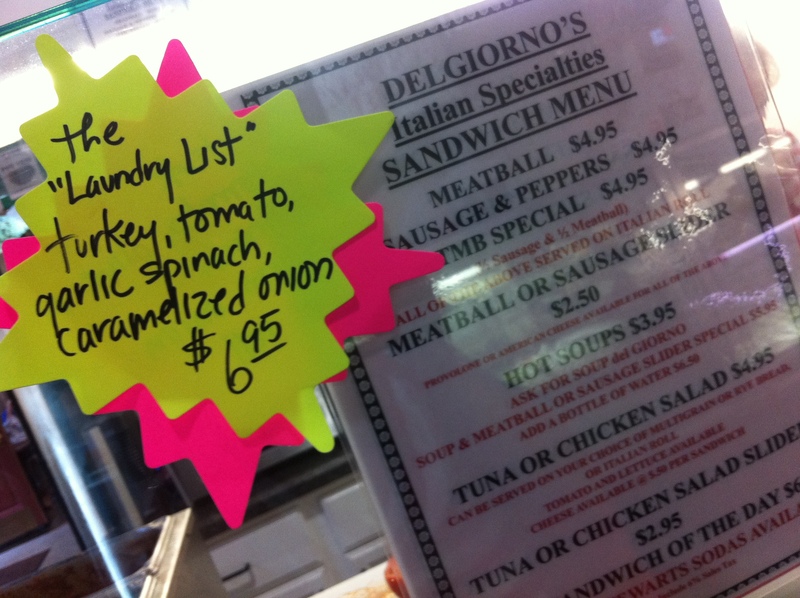 I chose the “Laundry List” sandwich. I also picked up an iced Chai from Mean Cup and was lucky enough to find a table to sit at and eat. As I sat and enjoyed my lunch, I wondered how much all of my veggies would cost at the grocery store. Was I really saving money by shopping at market? I certainly know that the veggies are higher quality. 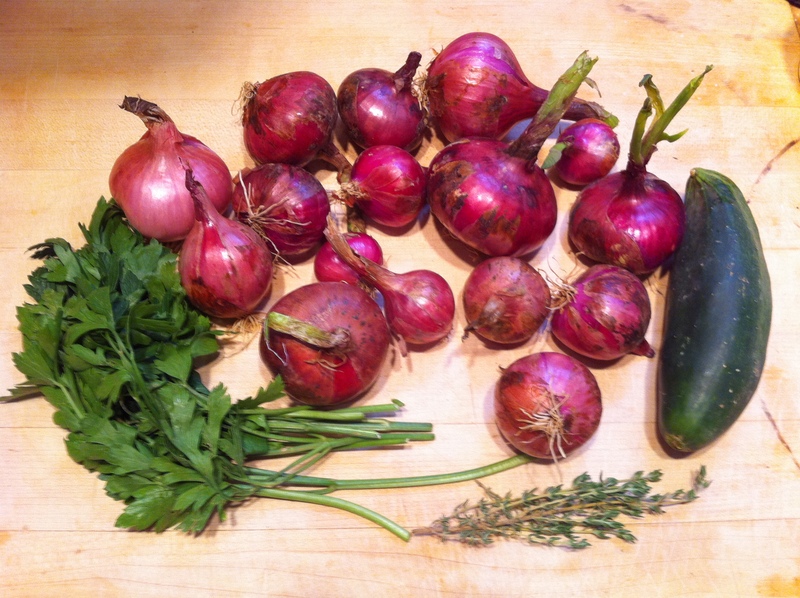 Even if I wasn’t saving that much money, I knew that I was getting better, mostly organic, homegrown stuff. I would probably pay more for it anyway. I decided to figure out the math and see if I was really saving money. My grand total from market was $23.70! I went to Giant to price the veggies. 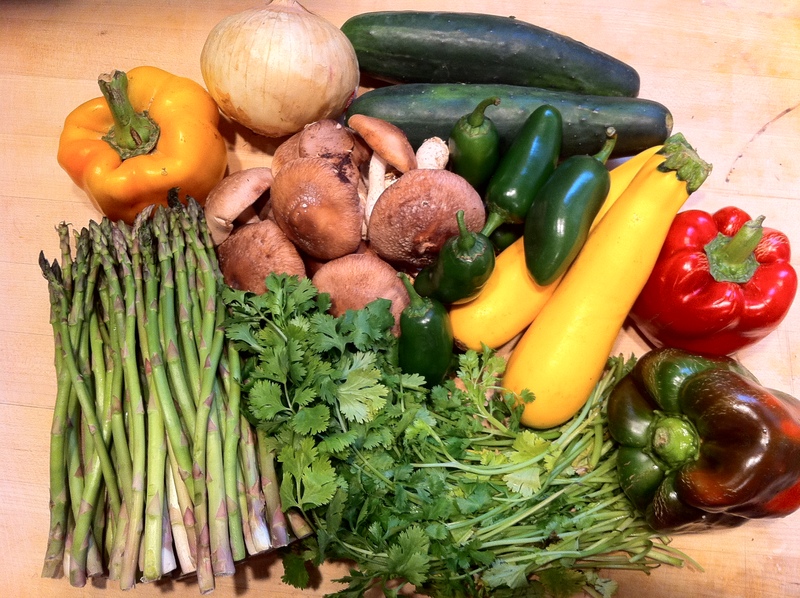 The total for all of these veggies if I purchased them at the local grocery: $30.97! So it was a comparable difference. I definitely think I am getting a way better bargain at market. This was kind of a light shopping trip for me this week. I usually purchase a lot more things like eggs, bread, and tomatoes. I will probably do another comparison with some of those items next time. I would also like to add that I did notice that Giant was carrying some local produce. As you walked in the door, they were advertising tomatoes, zucchini, and green peppers that were all from Lancaster county – nice to see! 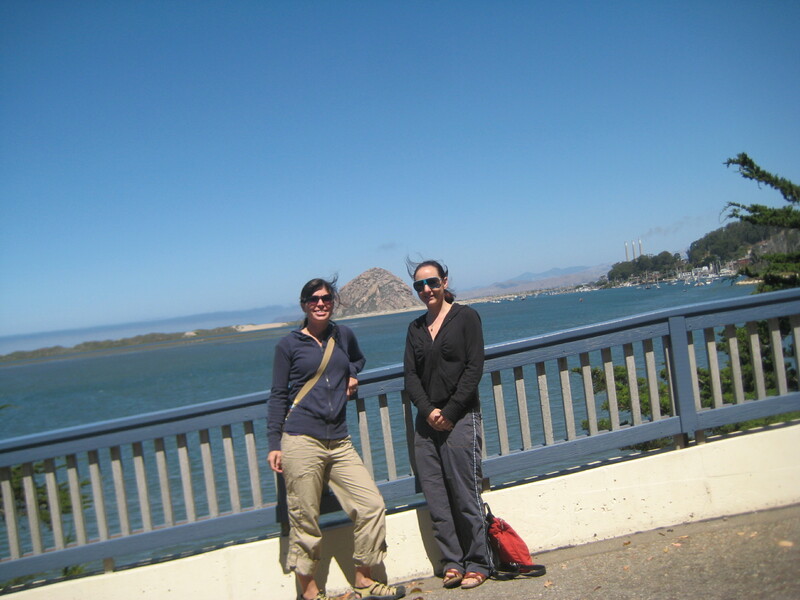 We drove from San Luis Obispo to Morrow Bay on Thursday (August 4th). We stayed at the Hostel Obispo the night before and had their sourdough pancakes in the morning. The batter was mixed but Janeen cooked them, so I had to do the dishes. There were no available rooms at the hostel for Thursday night so we were hoping to get a camp site by the bay. We headed out early and tried to get a camp site at Montaña de Oro State Park, with its beautiful golden hillsides looking out on to the ocean… but it was full! We did scored a camp site at Morro Bay State Park. The campground was really close to everything, only a short ride to the center of Morro Bay town. There was also a great coastal Natural History Museum with info about the bay and a very helpful volunteer who told us where we could see otters and elephant seals! Just a note about the California coast** The campgrounds, hostels, and hotels up the coast fill up quick in the summer months. We hadn’t made any plans but we kind of lucked out every night and found somewhere to sleep. If I make this drive again I’ll probably try to make some plans. I should have learned that from the time I visited with Dan two years ago. We had a really hard time finding places to stay and camp. It may cramp my go-with-the-flow adventure style, but it might save some morning hours spent searching for somewhere to sleep at night. We started our Day in Morro Bay walking Embarcadero Street and checking out the shops and looking at sea lions from the docks. 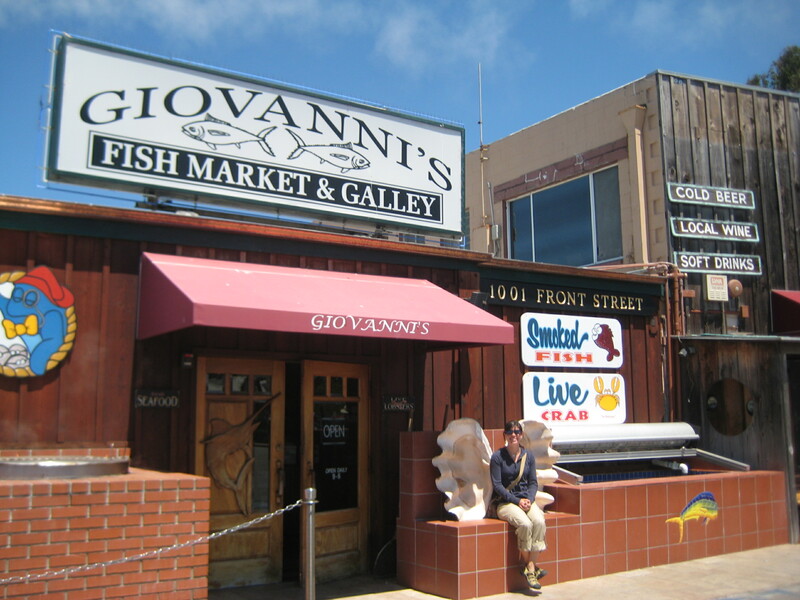 We decided to go to Giovanni’s Fish Market for an early lunch. 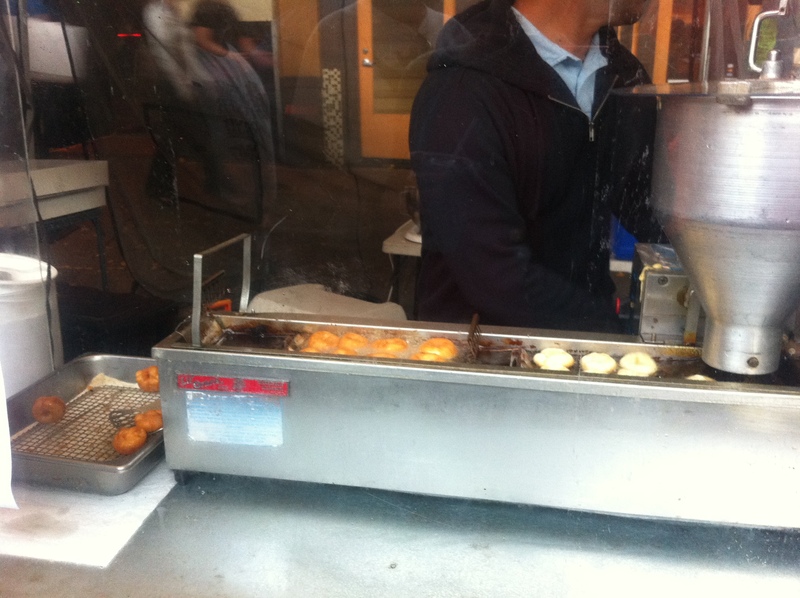 I knew we made the right choice when I saw that the line outside the order window was long and the tables were busy. I couldn’t decide what kind of seafood to try but I did know that I wanted their famous fish and chips. 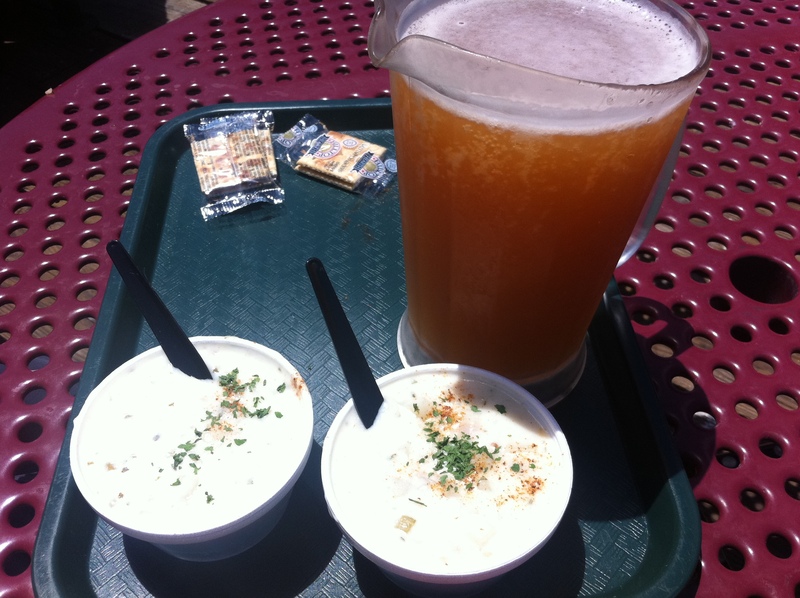 I started with a cup of clam chowder. 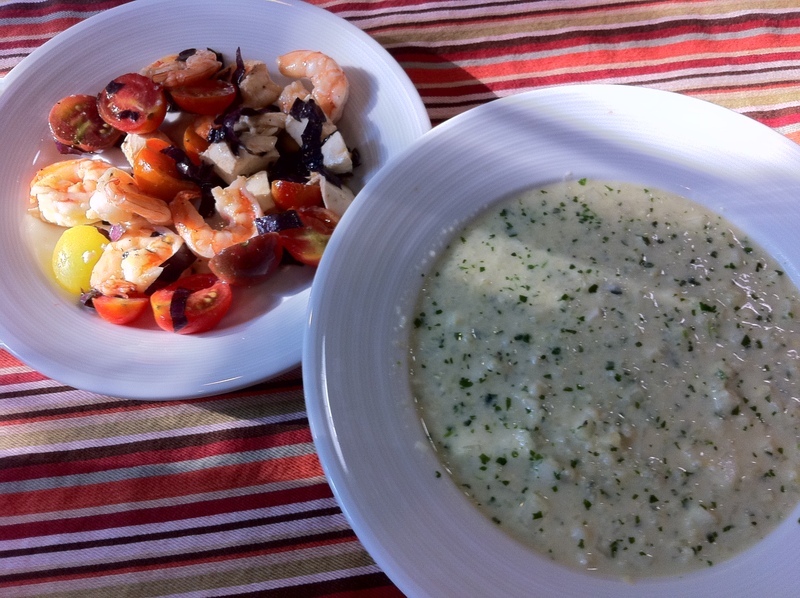 So fresh, creamy and loaded with clams. We washed it all down with a Hefeweizen from Widmer Brothers brewery in Oregon, This seemed to be a popular brewery around CA, I kept seeing it everywhere. I was a really good Hefe and it went great with the fish. I ended up with a variety basket of fish, shrimp, scallops, and squid. The fish was the best thing in the basket! 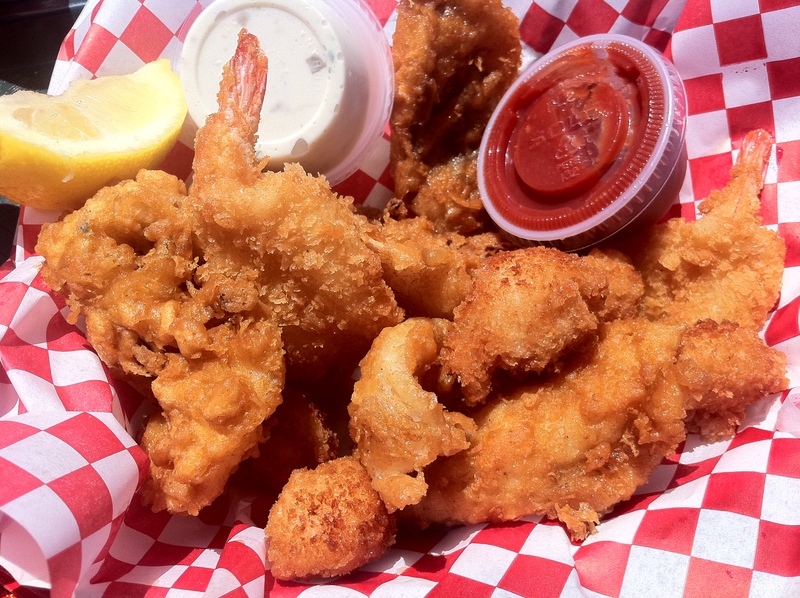 The fish and squid were coated with light beer batter that was much better than the bread-crummy batter coating the shrimp and scallops. I recommend sticking with the classic if you go here. I would upgrade the french fries to garlic fries! I saw this on the menu and I wondered what it was… I thought maybe they just threw some garlic powder on top but it was $2 extra so I thought that it had to be something more special than that. I was right! 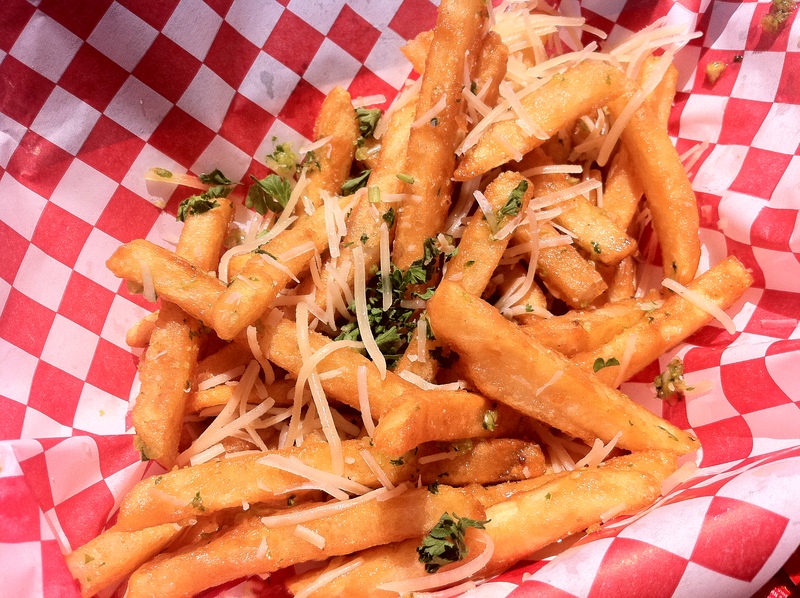 They took fries that were already great and added fresh garlic, fresh chopped parsley and real Parmesan cheese to them. The result is delicious and right up my alley. After completely stuffing ourselves for lunch we need to take a walk. We walked all the way out to Morrow Rock – a volcanic rock that separates the bay from the ocean. The town saved it from being demolished a while ago and now it is a huge nesting ground for shore birds. You can see it in the top picture behind me and Janeen. There were otters playing in the kelp at the bay, squirrels making boroughs in between the rocks, and birds flying everywhere. 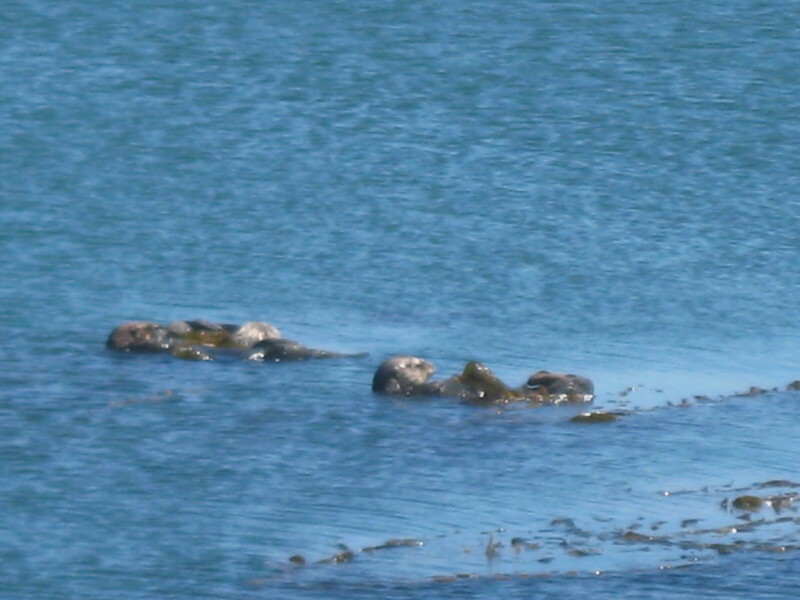 Here’s some of the sea otter family floating in the kelp, enjoying their lunch of urchins and shellfish. 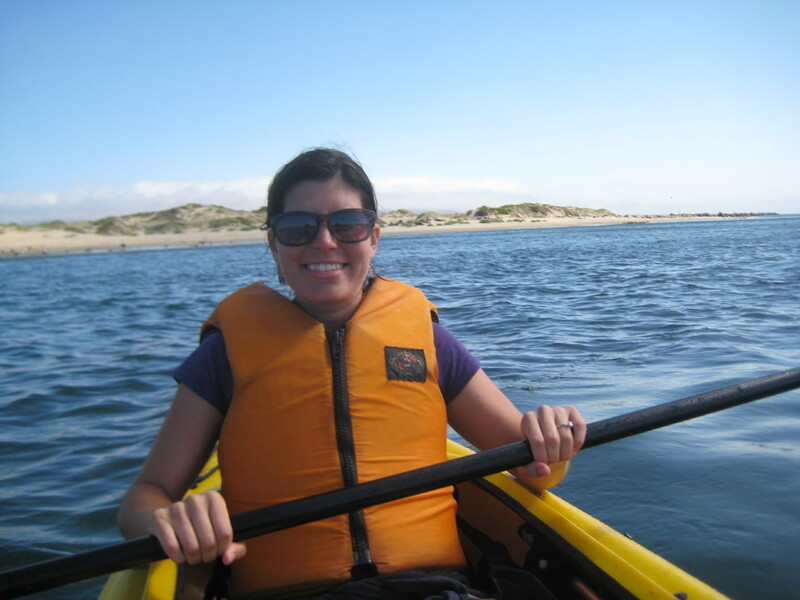 Our walk inspired us to rent a kayak and get right in the bay. A good idea but it was super windy that day and a bit harder than it seemed it should be. 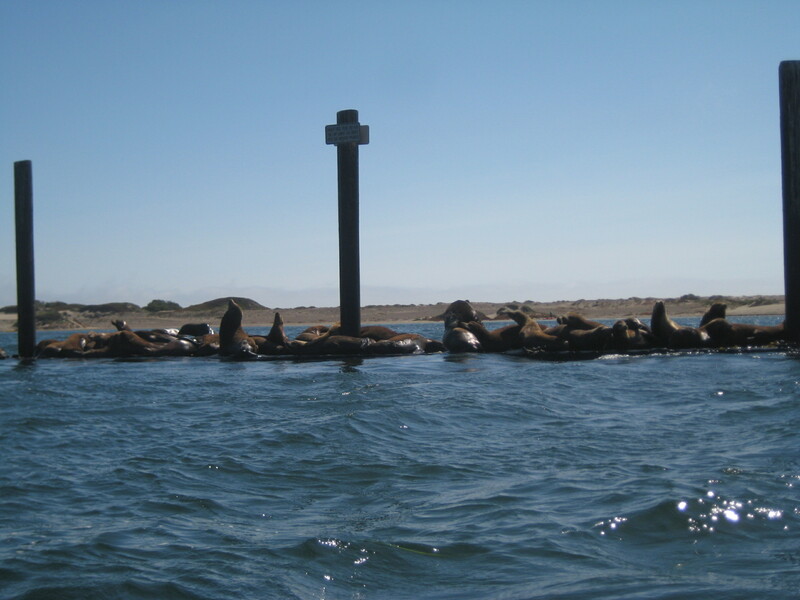 We did get closer to the sea lions and otters, and we got to paddle through the shallow waters where jellyfish were floating and seaweeds were growing. So the kayaking was kind of hard. I got totally soaked and full of sand. I tried to get off on the sand bar island and sank into the muddy sand, it was still fun though. 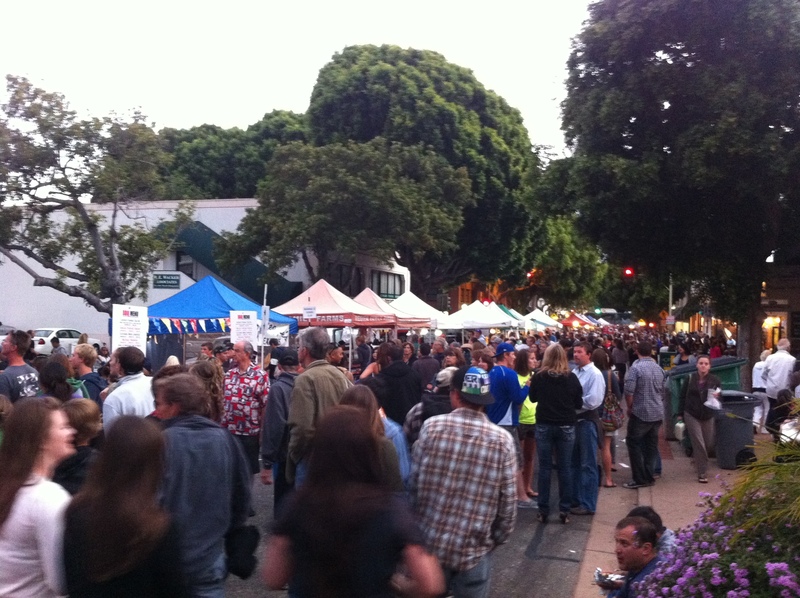 We were a little exhausted but we still had a great night – We went back to San Luis Obispo for an epic farmers market… stay tuned! 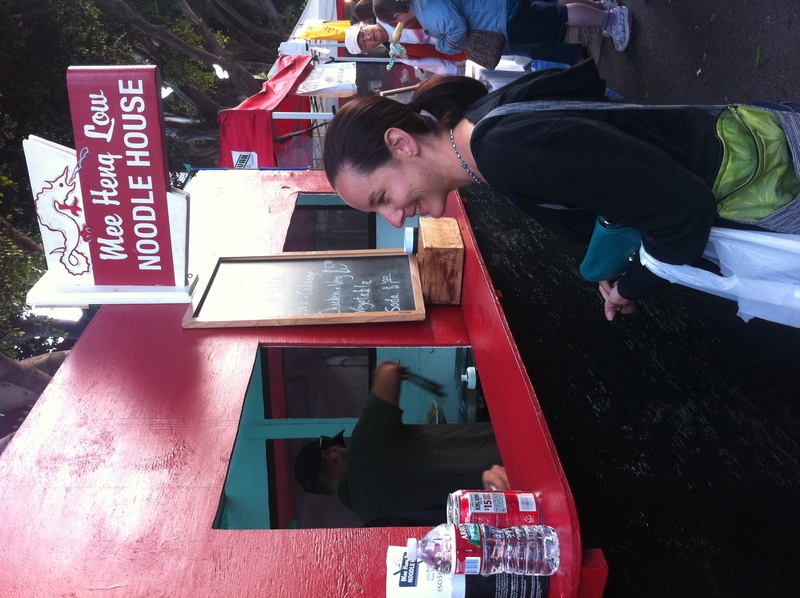 Back to the California trip… It’s about time for a famous eatery stop. So on Wednesday (August 3rd) we had hot dogs for breakfast. 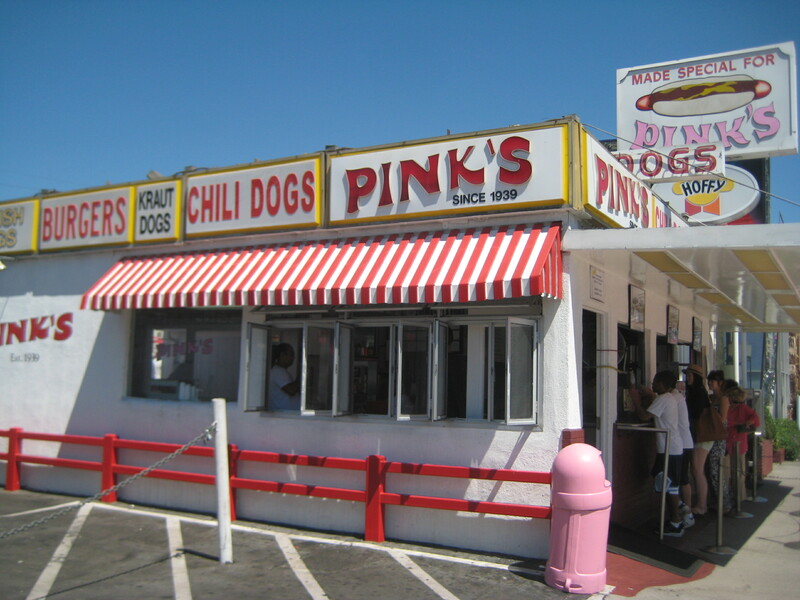 We choose Pink’s Famous Hot Dog Stand on LaBrea Avenue in Hollywood. Pinks has dozens of condiments and topping combinations on their famous dogs. 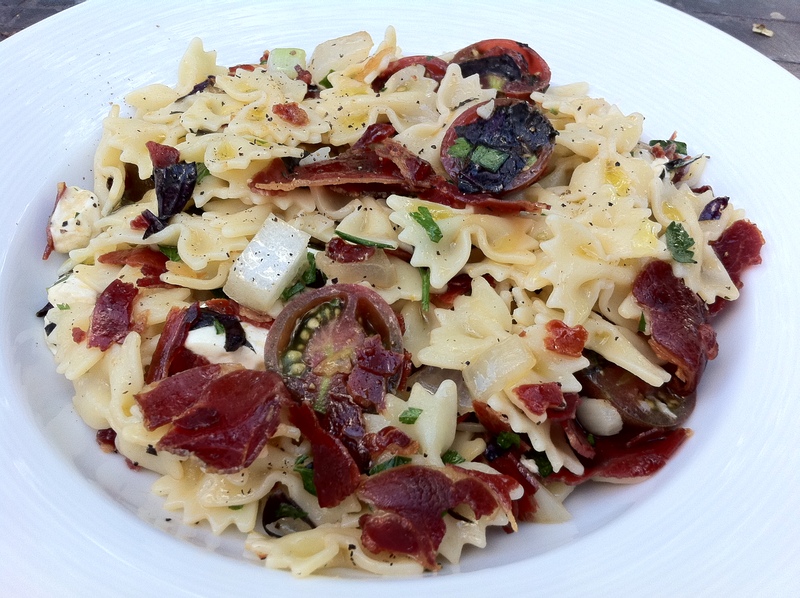 The specials are named after famous stars, chefs, TV personalities and landmarks. I chose the Emeril BAM! Dog. Emeril has a new show called The Originals that featured Pinks on one of the episodes about LA. It airs on the Cooking channel if you’re interested in finding it. 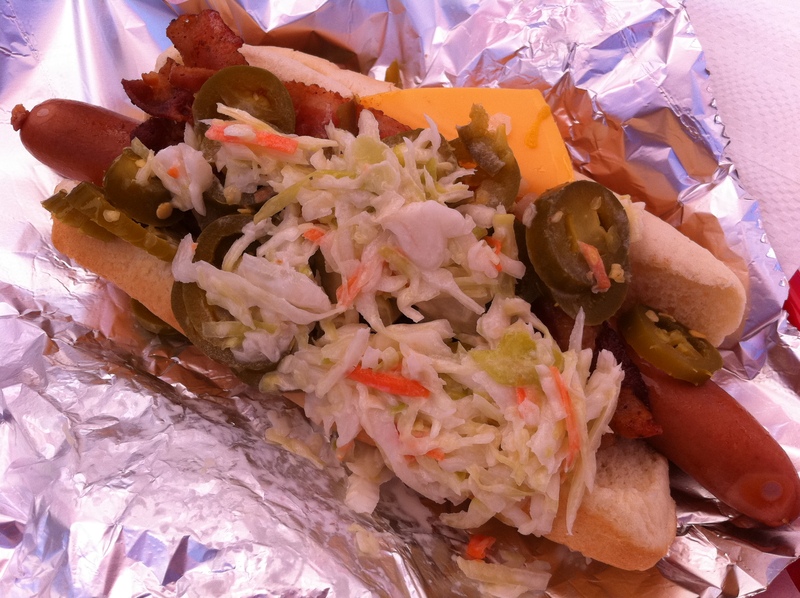 This special dog had cheese, jalapenos, mustard, onions, bacon, and cole slaw. I had to take a lot of the jalapenos off because there were so many they were falling out of the bun. I also am not a huge fan of pickled jalapenos, or bacon for that matter, but the cole slaw pulled me into picking this dog. The combination overall was BAM good, I would get it again! Janeen got the Pastrami Reuben Dog, not named after any celebrity but I think it was famous all by itself. 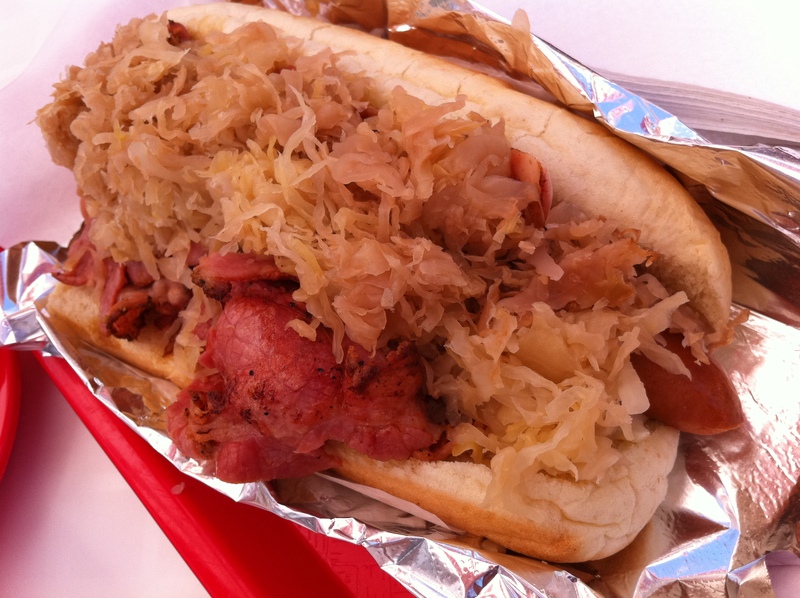 it was loaded with sauerkraut, pastrami, swiss cheese, and mustard. I tried it and it was a mouthful of meat. there was so much pastrami on it, it was falling all over the place. It was a fine dog. 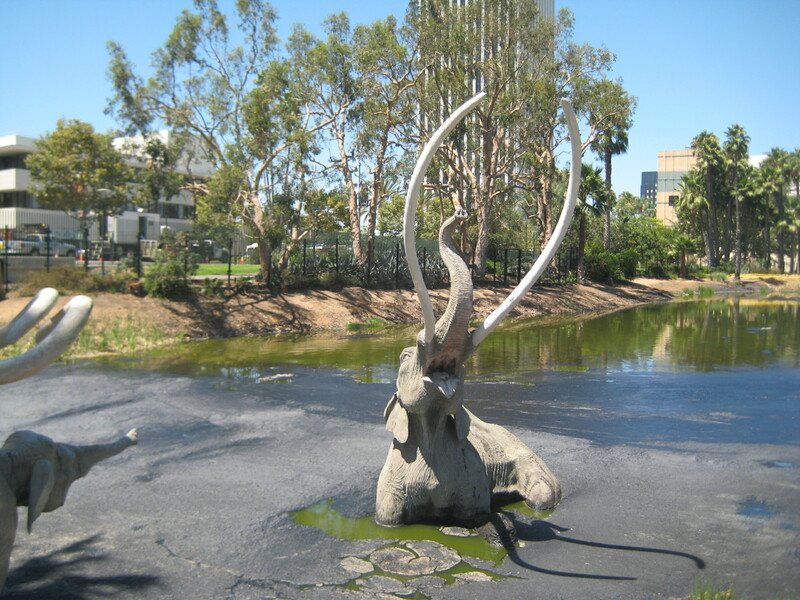 With our bellies full of hot dogs we drove through Miracle Mile and into the La Brea Tar Pits. I’m kind of a science nerd so I thought this stop was great. The Page Museum held a lot of the fossils they excavated from the tar pits. There are also open sites that they are working on that you could observe. We drove back across Hollywood into Echo Park to eat a late lunch at The Park restaurant, which the wonderful Erin caters to the lunch time crowd. Janeen and I had an identical lunch today. 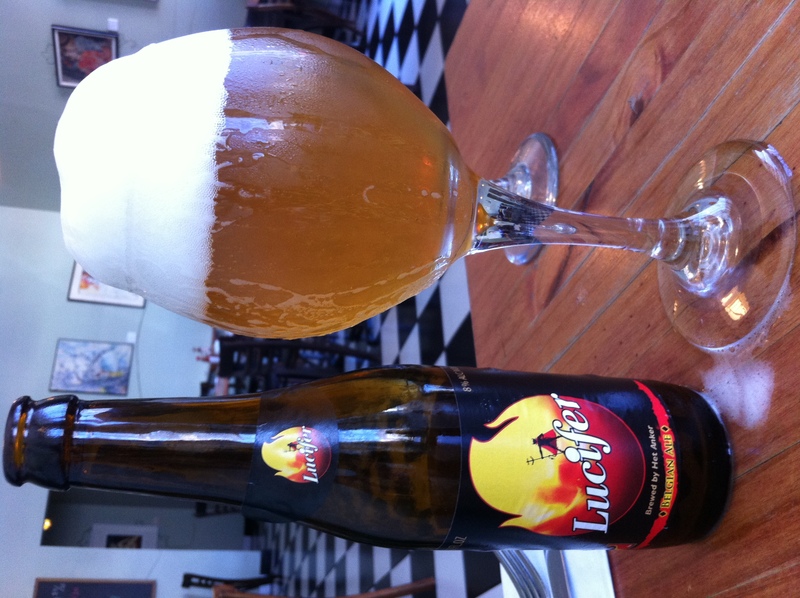 We both got Lucifer Ale, a nice light Belgian with hints of apple. The Park has sandwich specials that all looked so good it made it really hard to choose just one. I went with some thing kind of light because I ate the hotdog for breakfast… I enjoyed the avocado and Gruyère sandwich piled high with avocado, Gruyère cheese, tomato, and lettuce. 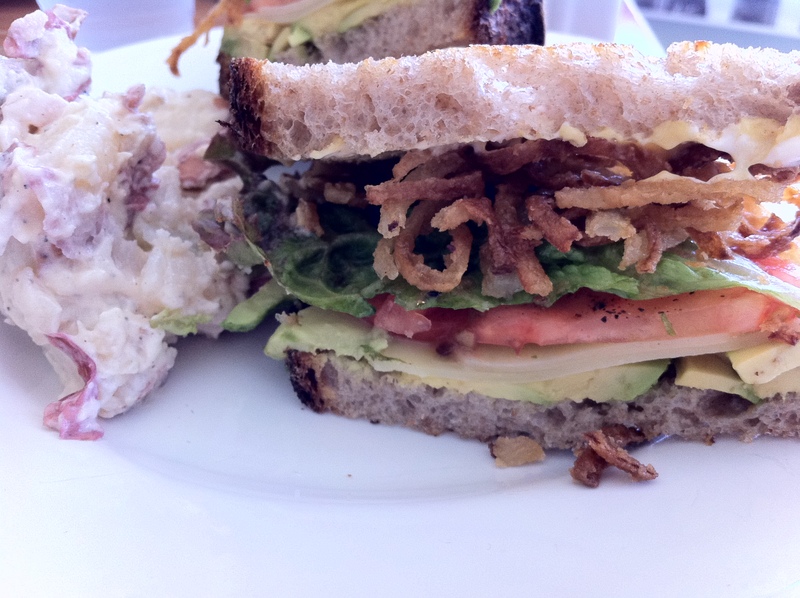 I added crispy onions, as per Erin’s recomendtion and spread some Dijon on the grilled whole wheat sourdough bread. It was nice light and delicious, perfect after a morning of looking at gas bubble out of pits of black asphalt smelling pits. So we headed out late that afternoon to drive up the coast. We had one perfect stop as we made our way North. I was reading “taste of Santa Barbara” magazine in the car and telling Janeen about this amazing looking Gelato in Montecito. 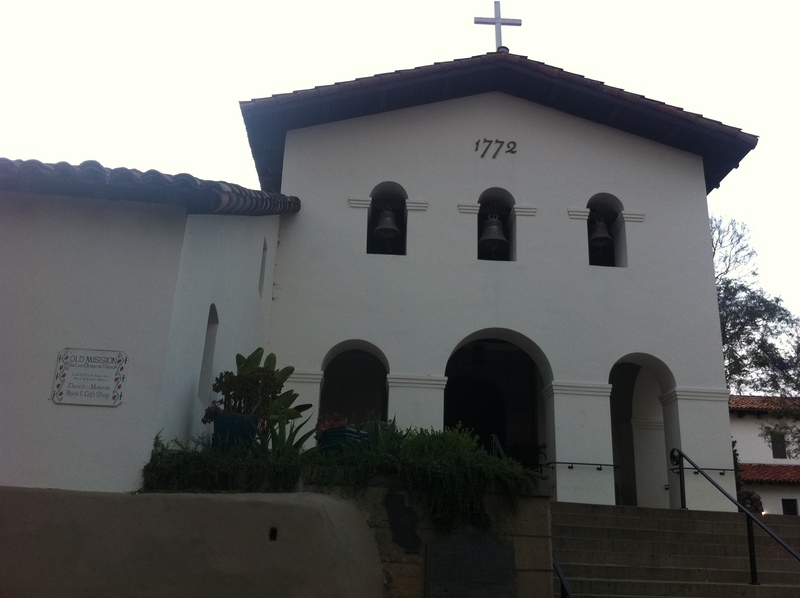 A little bit later she noticed that we were passing Montecito on the highway and said “wasn’t something in Montecito? oh yea, isn’t the Gelato place there?” So I checked the magazine and yes! So we pulled off the exit and 2 minutes down the road we were stopping at Here’s the Scoop for a Gelato dinner. This place it definitely worth the stop! They let you try any flavor you want and they make everything with local ingredients. Yes, I realize I keep writing about these places using local, organic ingredients, but I am drawn to that so I am either a sucker for people writing local on everything or I just pick really awesome places… probably a little bit of both. 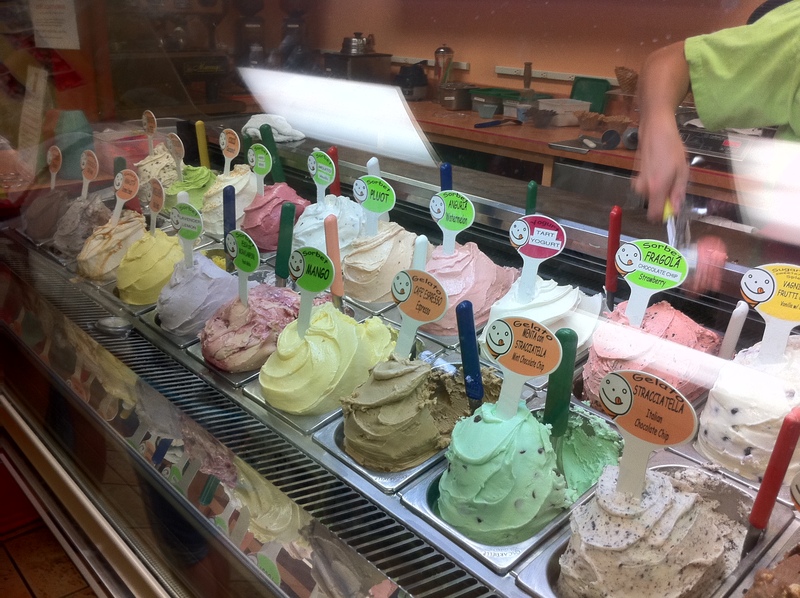 Anyway… The gelato and sorbet are out of this world awesome at this place. I tasted the lavender lemon flavor which was crisp and refreshing but I ultimately decided on one scoop coconut, one scoop chocolate strawberry in a waffle cone. 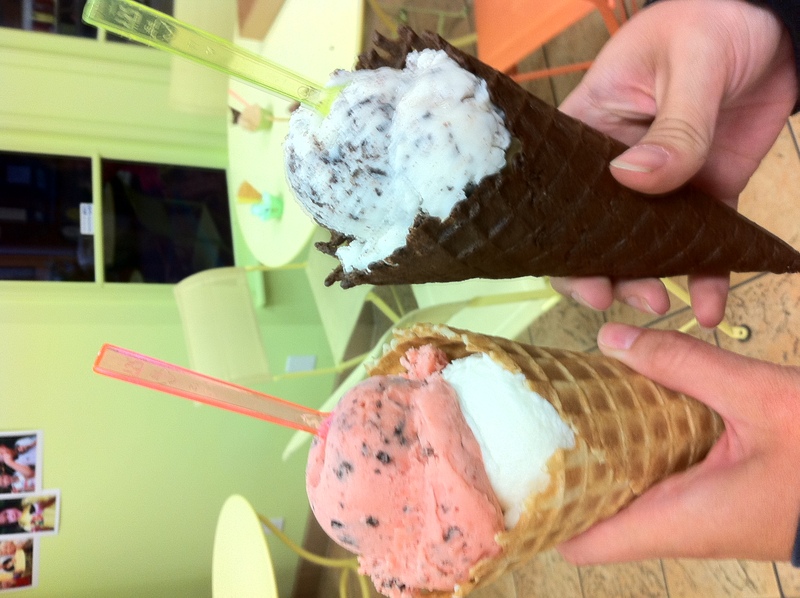 Janeen got Italian chocolate chip (which tasted like cannoli filling) and espresso in a chocolate waffle cone. All flavors got my stamp of approval and left me wanting more. 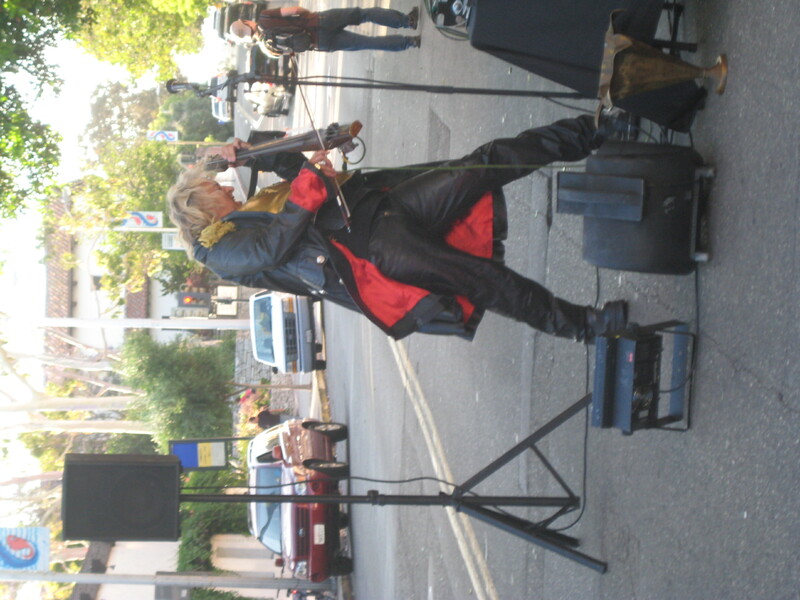 On our Tuesday (August 2) in California, we headed down to the beach towns. We strolled along the Third Street Promenade in Santa Monica in the morning to window shop and have brunch. We chose a little french cafe in the middle of the promenade called Monsieur Marcel. We sat outside watching passer-bys. 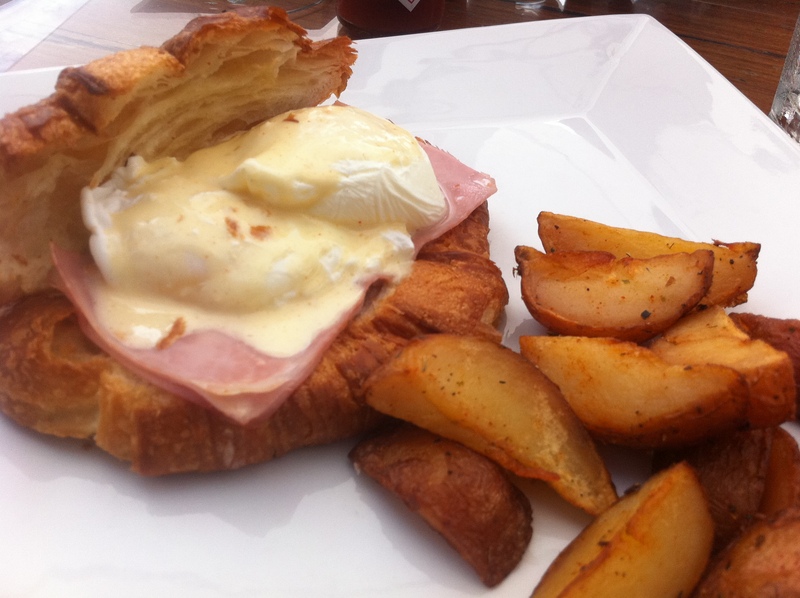 I ordered the Benedict Marcel- poached eggs atop a buttery croissant with smoked ham and Hollandaise sauce. It was good, a solid take on eggs Benedict, but not the best I have ever had… Janeen asked me where the best eggs Benedict was and I immediately replied two places… The Nodding Head Brewery in Philadelphia (they have sunday brunch with excellent bloody marys) and this little shack (can’t remember the name of it) beside a river in Connectitcut that I stopped at on the way back from cape cod. 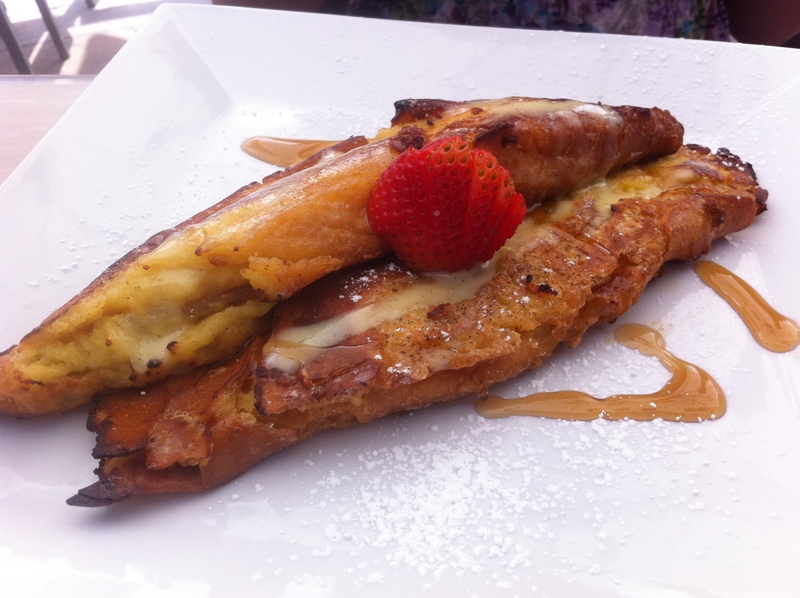 Janeen had the souffle french toast. I tried it – it was super-good! It was so good I wished I had gotten in. 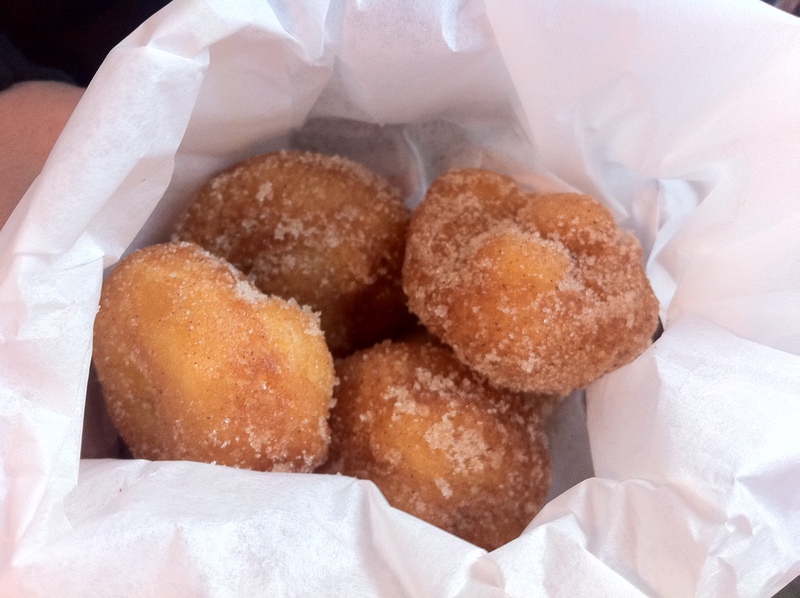 It was soft, fluffy, buttery and it had a slight citrusy taste to it. French perfection, that’s what I would call it. If you ever find yourself eating brunch in Santa Monica, I highly recommend it. We checked out the pier and rode the ferris wheel to get a birds eye view of everything. 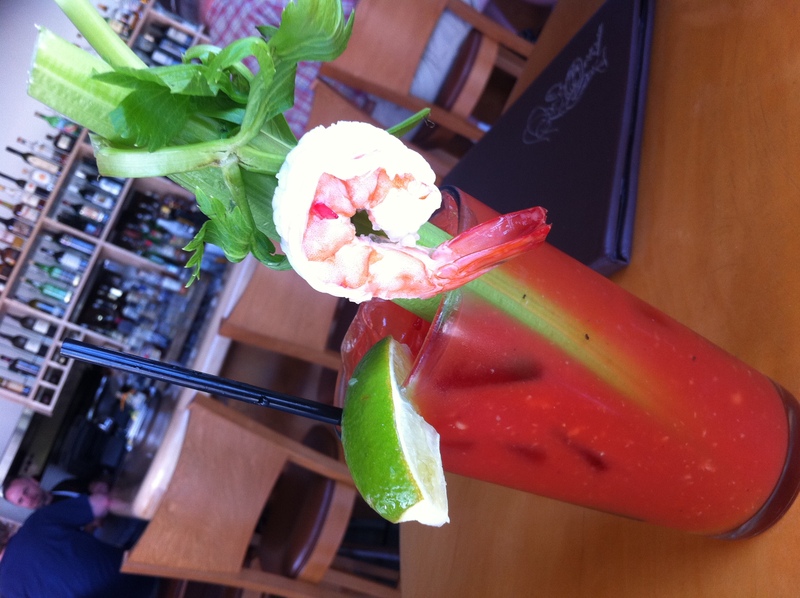 Then we took a tip from Erin’s friend and went to The Lobster for a large bloody mary with a giant prawn and olive attached to it. It was a good bloody mary, kind of mild but really impressive looking. It was a nice break from the sun and we got some post cards written. We rented bikes and rode the sandy bike trail down to the complete spectacle that is Venice beach. We locked the bikes by the skate park where skaters were zooming around the concrete learning tricks. The two headed turtle was out in front of the freak show and it seemed all the usual buskers were out. We stopped into a cafe that was set back a little from the boardwalk. They advertised Peach Chai, which sounded good, so we decided to try it. Not really that great, it was ok but I would def not go there again. Janeen got an iced vanilla latte that was so sweet she didn’t even really drink it. I can not remember the name at all but I don’t think I’ll be going back. We walked the whole ocean front, headed back to our bikes, and rode back to Santa Monica. On our way out, we knew there was going to be a lot of traffic and it was going to take a long time to get back, so we got a snack. 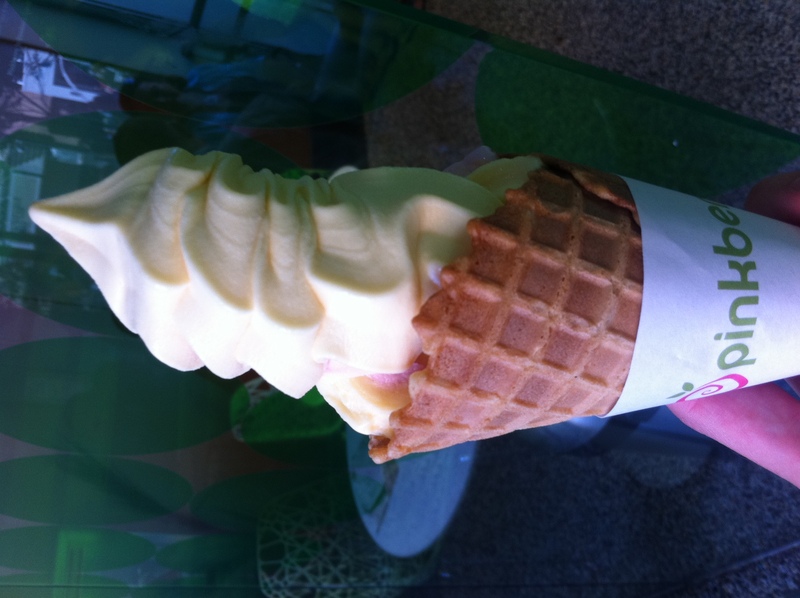 We sampled the frozen yogurt at PinkBerry. 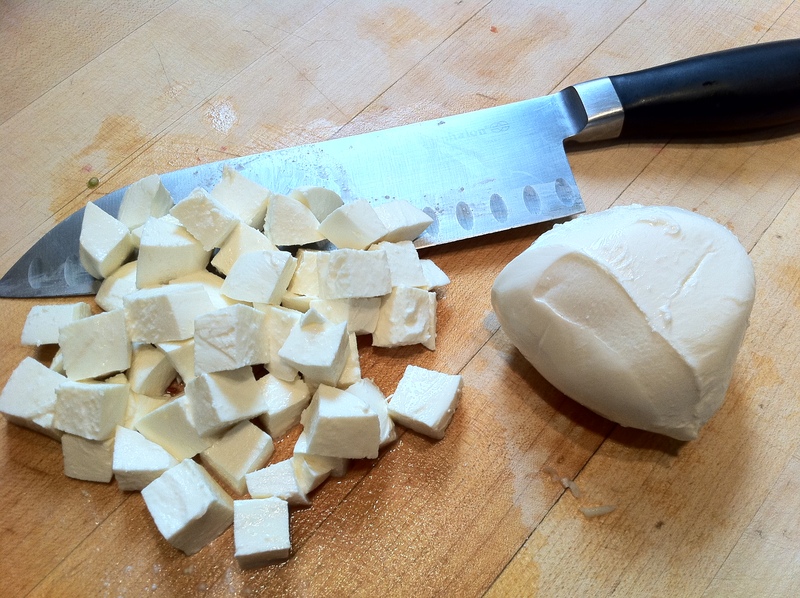 It is all fat free and made with ultra fresh ingredients. We had to rush once we got back to Erin’s place because we were going to her comedy show in Downtown LA and we didn’t have much time. Erin was nice enough to make us dinner. 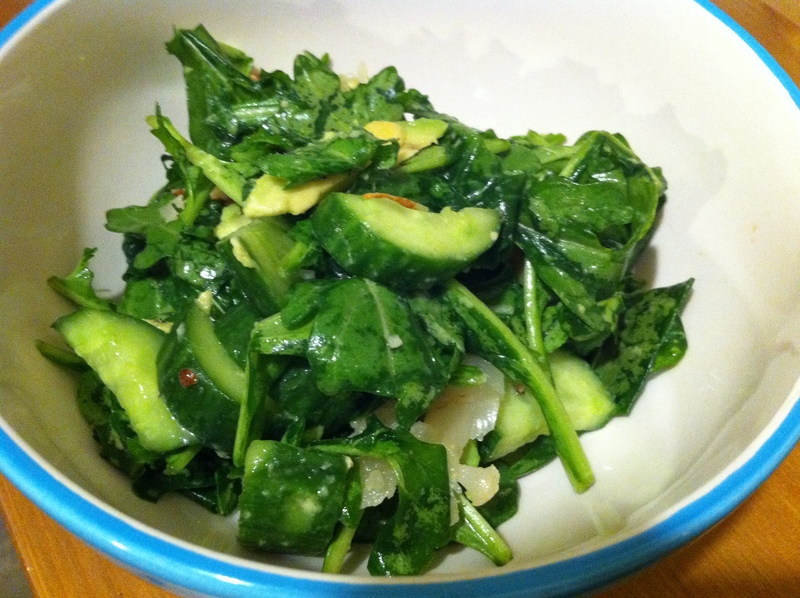 Arugula salad with lemon vinaigrette with little cukes and avocado slices. 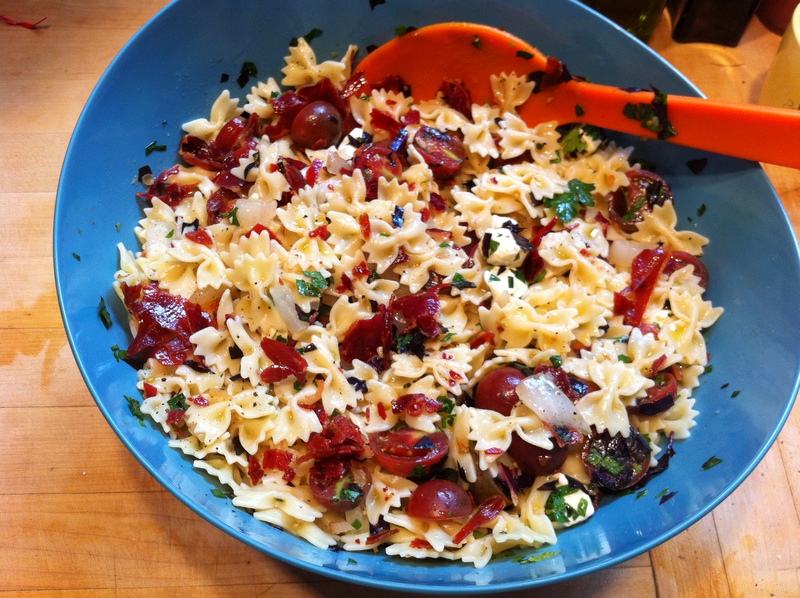 She even cut up some pickled cauliflower (from giardiniera) and added slivered almonds. Great salad Erin! 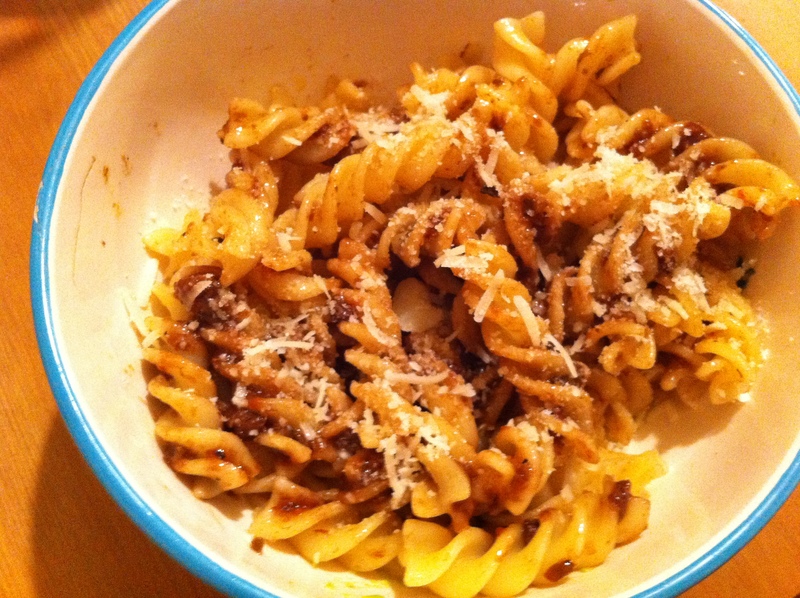 We also had pasta with olive sauce that we got at Global Gardens on our wine tasting adventure. Erin’s comedy show was great! It was at a theater called the Downtown Independent. Finally a place with some Sierra Nevada! Good beer, good laughs. Thank you Erin for a wonderful evening! It’s Monday! I got here really late last night and there was a crazy lightning storm so we hung out in side for a while. I haven’t had time or internet to post the rest of my California adventure. I did keep writing about it so I will post those throughout the week as I have time. 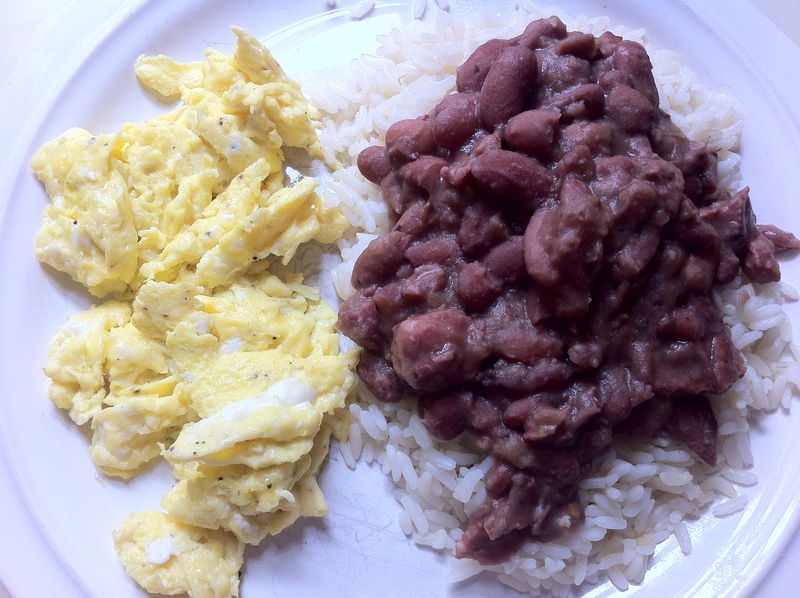 Dan had this great idea that we should try to make red beans and rice while we are here. It is a traditional Monday thing to do in Louisiana (or so I read in the New Orleans cookbook this morning). 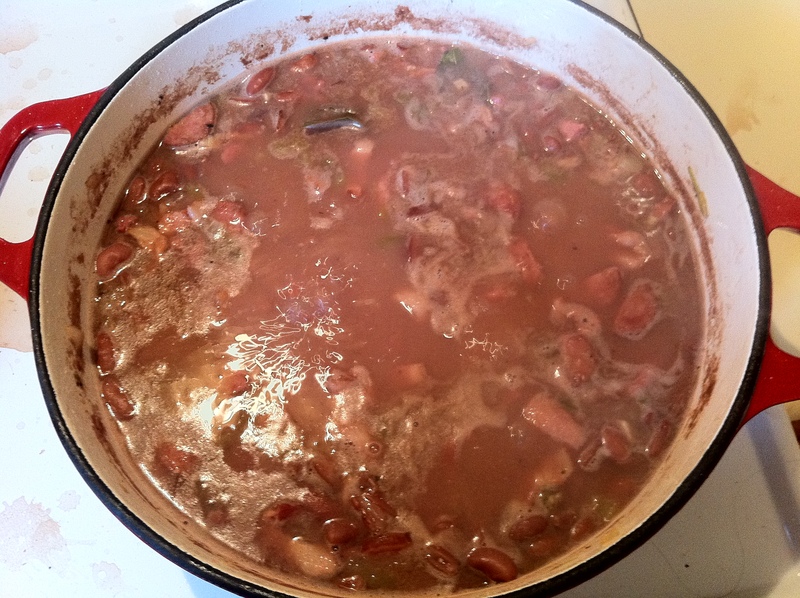 So it’s Monday afternoon and we are simmering red beans and rice right now. Soak the red beans in a pot completely covered in water overnight. 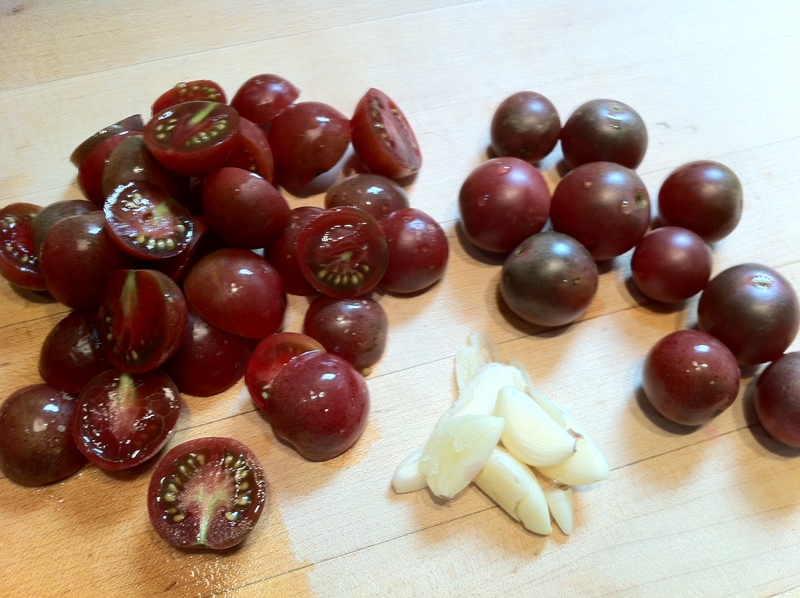 drain and rinse them in the morning, cover with water again and boil for 1 hour. Chop the onion, celery, and bell pepper small – they call this the Trinity – a popular base for a lot of cooking Creole dishes. 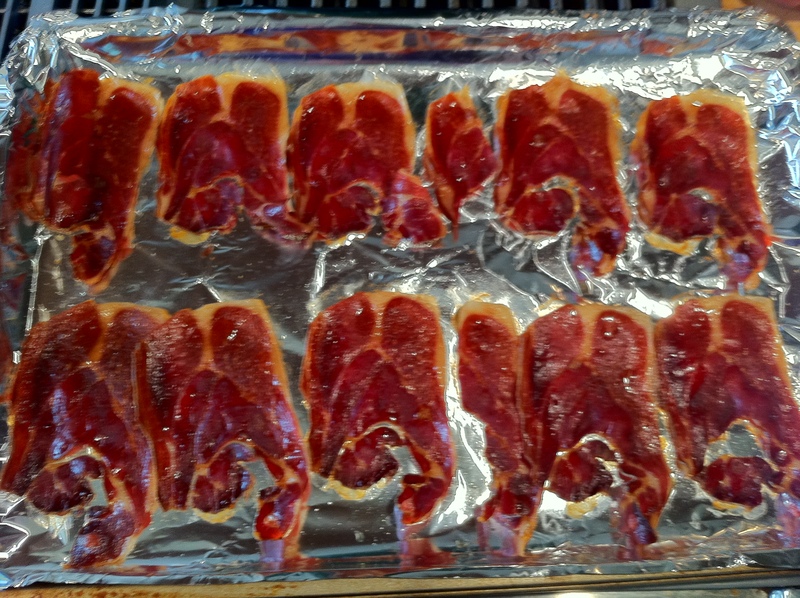 Chop the pickled pork and bacon into small pieces. In a large dutch oven, saute the bacon to render the fat. Add the Trinity and garlic and saute until the onions are translucent. 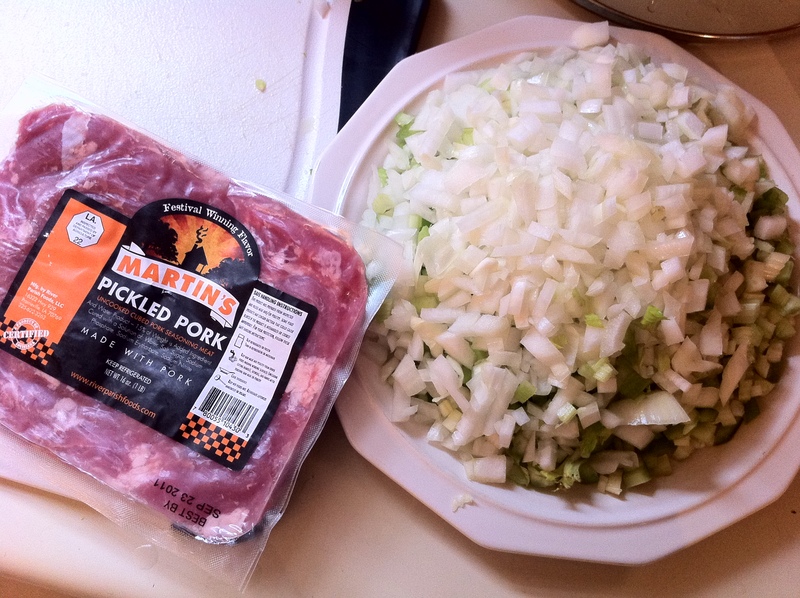 Add the pickled pork and cook for a few minutes.Season with salt and pepper and add the Cajun seasoning. Add the beans and cooking liquid to the dutch oven and stir. Let it simmer for about two hours, stirring occasionally. Cook the rice by bringing the water, salt and olive oil to a boil. Stir in the rice, cover and turn the heat down to low. Allow to cook for about 20 minutes, turn off the heat and let sit for about 20 minutes. 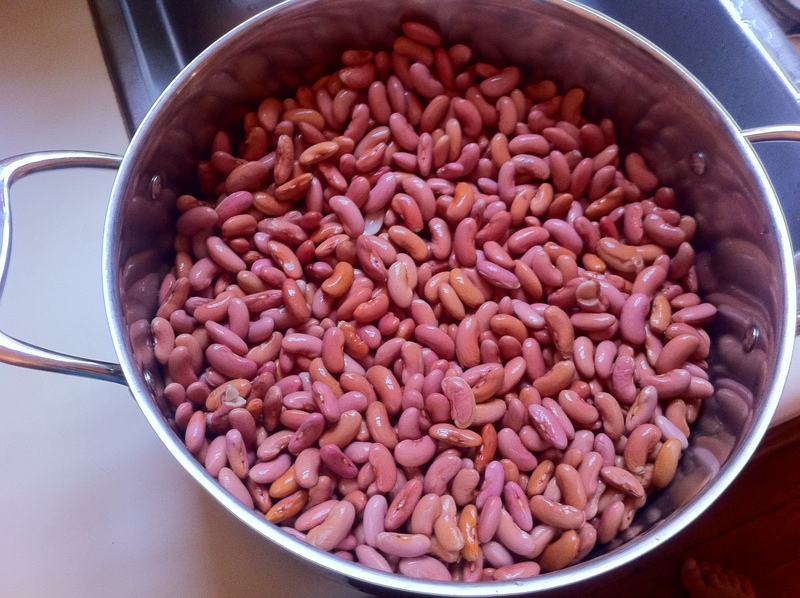 This makes a lot of red beans! 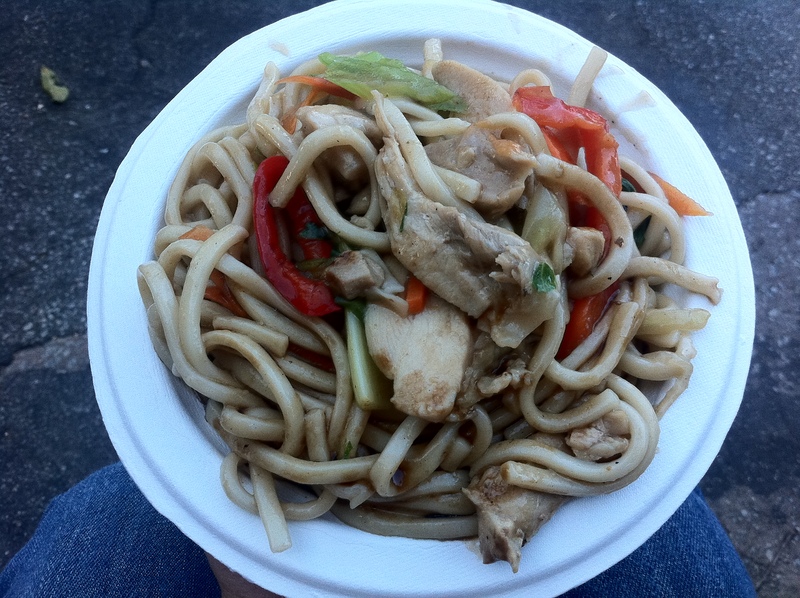 It will serve 6-8 people or you can just eat it all week- which is why it is the traditional Monday dish. I actually ate it with scrambled eggs on the side the next morning and it made a great breakfast. 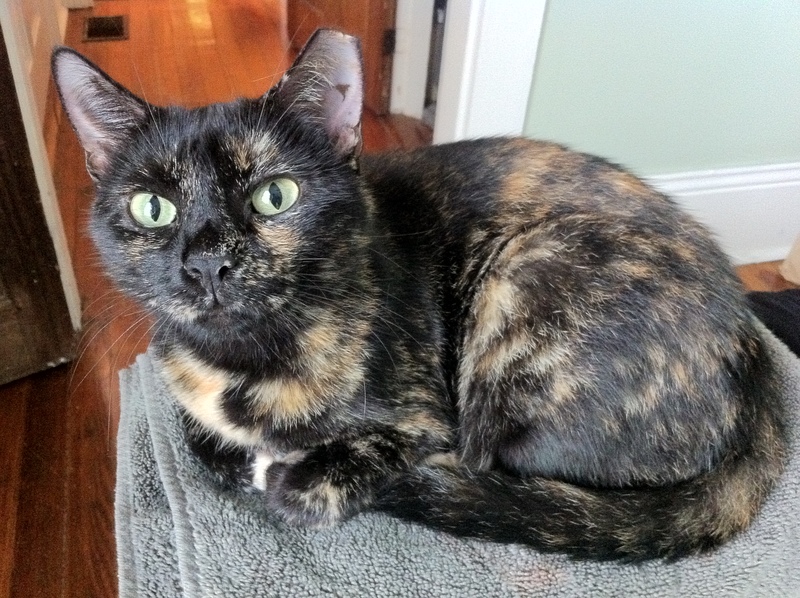 Here’s our temporary cat for the week. She likes to sit and watch you cook. I can’t tell if she is waiting for food or waiting for attention. We have been having some jam-packed days here in LA! I have been so busy that I hardly have time to write. On Monday (August 1st), we headed to Malibu for some beauty and beach time. We started off the day right with a good breakfast. We went to there’s no place like Home restaurant in Los Feliz. 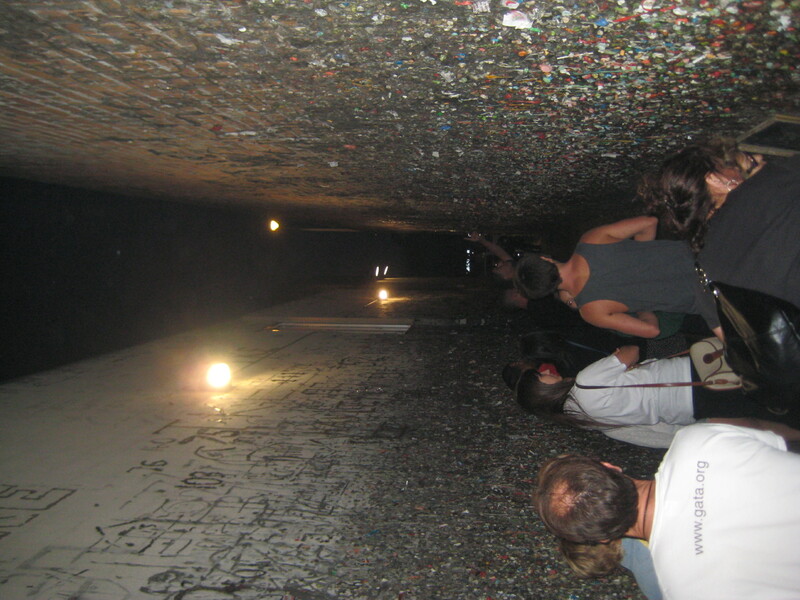 I went here once before when I was in California. Last time, I had the breakfast burrito. It was giant and really good. Erin got the breakfast burrito this time (I think it is her favorite). This place has a good deal on breakfast. There’s a special before 11am – $6.50 for any of the starred menu items – what a deal! And all the starred items looked like they were the best things on the menu to me. I couldn’t decide what to get so I shared two things with Janeen. We ordered the California breakfast sandwich. 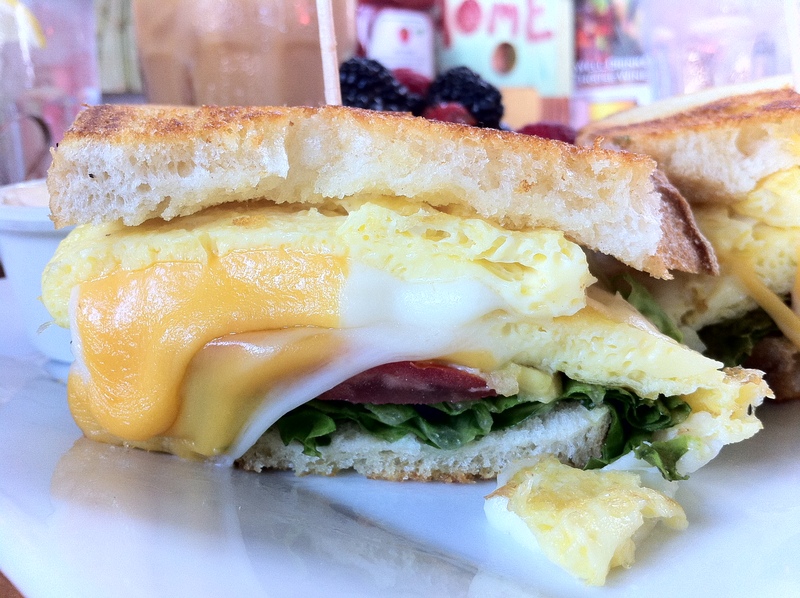 It had eggs, two kinds of cheese, tomatoes, avocado, lettuce, and chipotle mayo on sourdough bread. I ordered the side of fruit. It was fresh and full of watermelon, honeydew, blackberries, and cantaloupe. 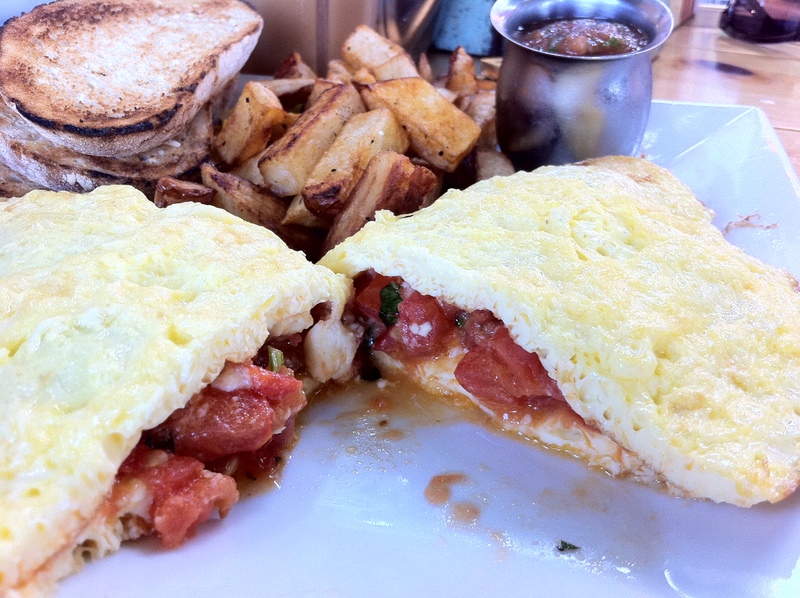 We also shared the Pomodoro Omelette. 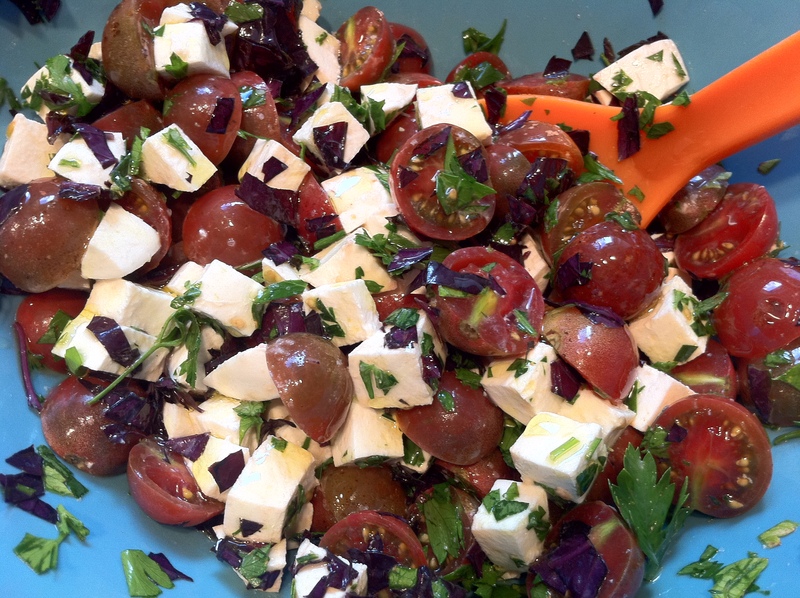 It was filled with tomatoes, basil and feta cheese. It also came with sourdough bread and a side of Spanish style home fries that were kind of like short french fries with peppers and onions. I haven’t eaten lunch or dinner here, but I give this restaurant a big thumbs up! 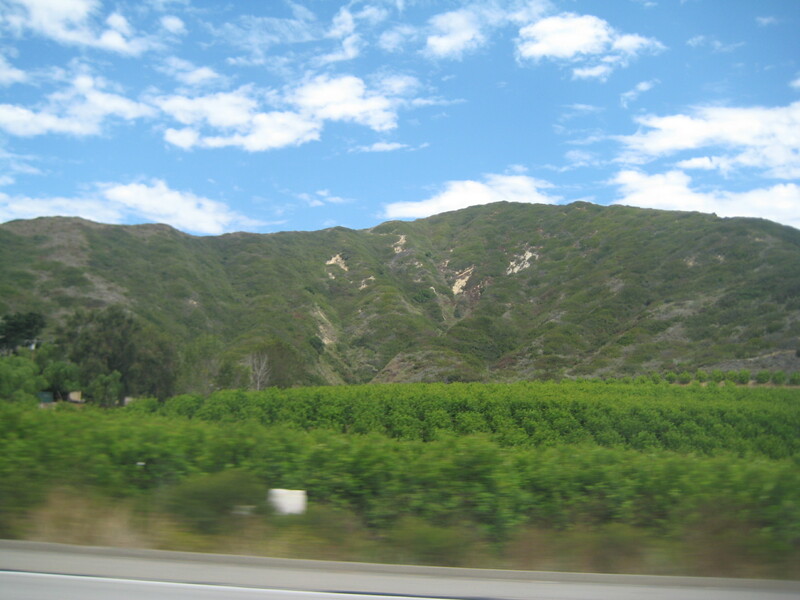 We took highway 101 to Malibu Canyon Road and drove through a deep cut canyon into Malibu. We stopped at a grocery store to get some supplies called Hows Market. Unfortunately, it is going out of business so I don’t know what will be there in the future but it was a deal for us because everything was 20% off. 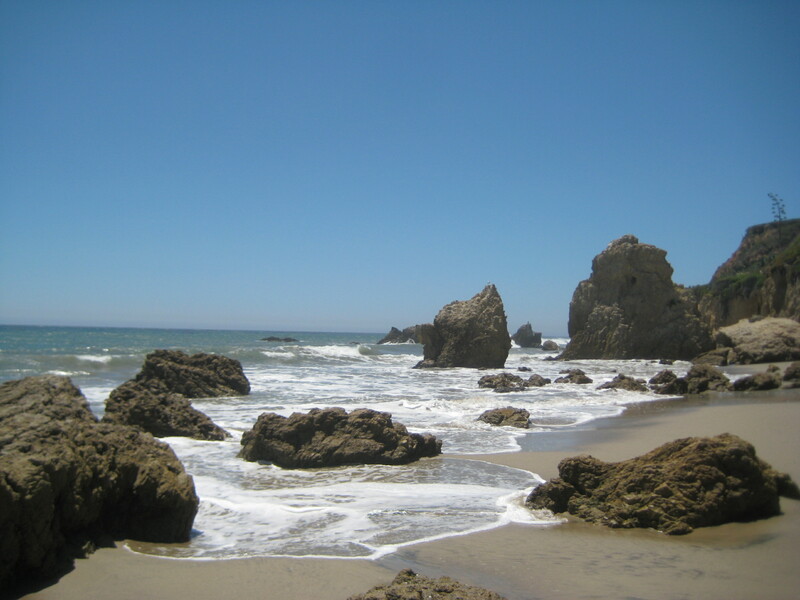 We packed a cooler with goodies and headed to the El Matador state beach. You have to climb down the cliffs to get to the beach, but it is totally worth it! The beach is rocky and beautiful. There are large outcrops of rocks jutting up out of the water. There were numerous professional (and unprofessional) photo shoots happening. We took a bunch of pictures and relaxed on the beach. It became rather windy just as we decided to bust out our discount goods to eat. 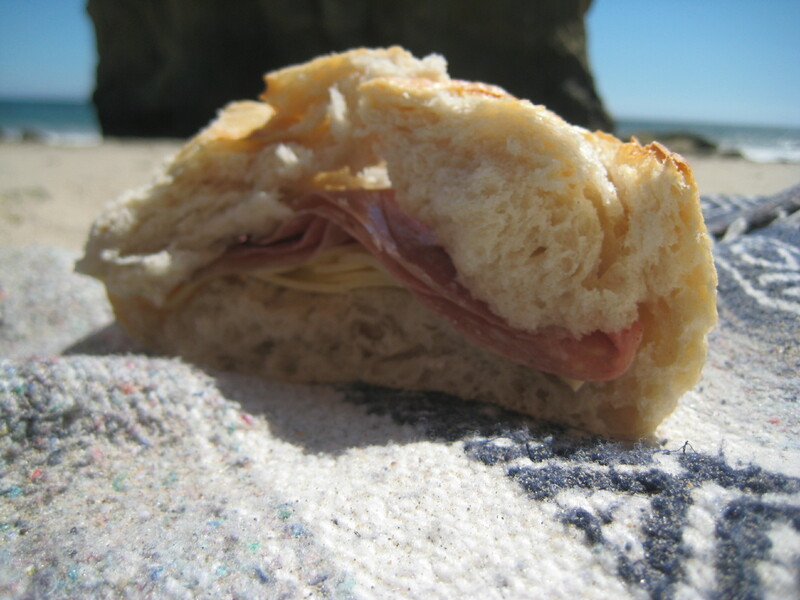 We made some salami and cheese sandwiches, and I mean SAND-wiches. 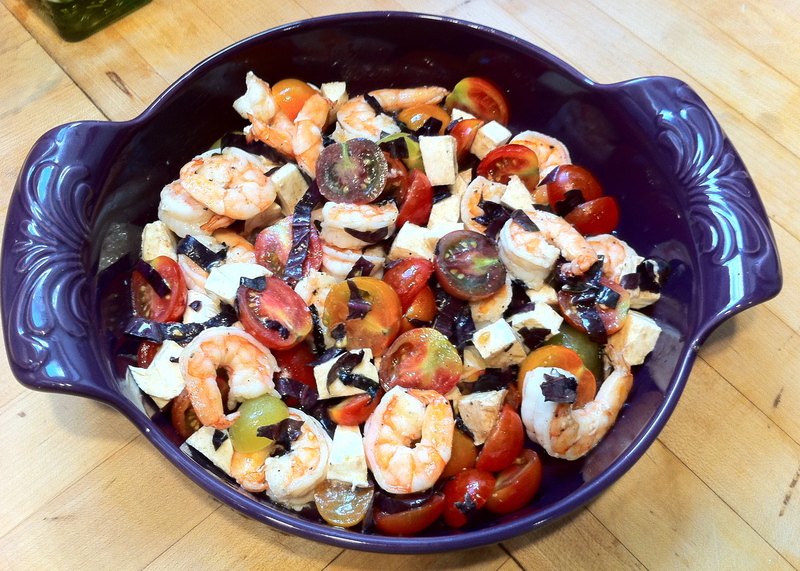 We also noshed on olives, pickles, and Trader Joe’s black bean dip… awesome beach snacks. We headed back down to LA after a great day on the beach. We didn’t have that much time to get dinner so we went to Leela Thai, right by Erin’s house in Silver Lake. There are countless Thai places in LA. There are probably two or more per block in some places! So I’m happy we had some since it is so abundant. Leela Thai is a nice little restaurant with outside seating. I ordered a Thai Iced Tea. Thai Iced Tea is usually too sweet for me but this one was pretty good, it was sweet but not overly done. They also brought us our water in small metal cups that seemed to keep the water ice cold (with no ice in it) the entire time we were eating. 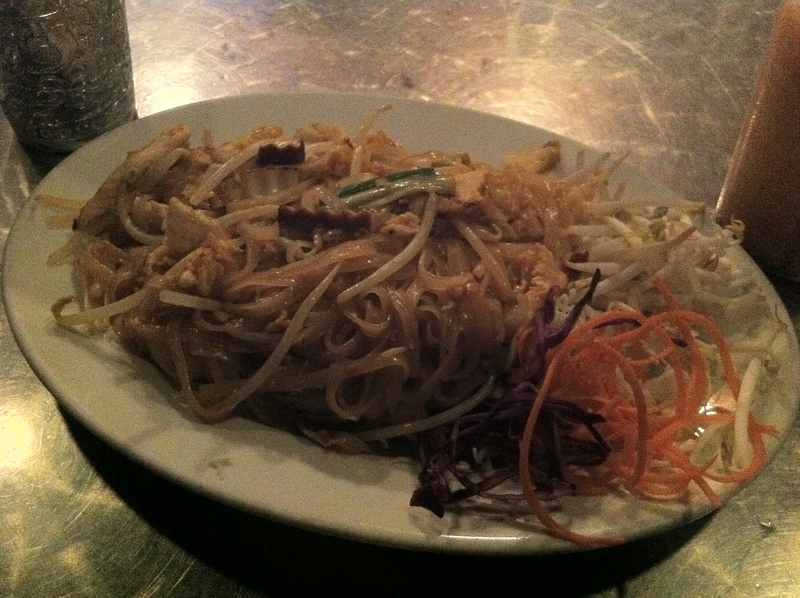 I had the Pad Thai with chicken. It was pretty standard but really good. It really hit the spot after a sunny beach day. So… we went in to Hollywood for the evening and what we saw was pretty amazing. 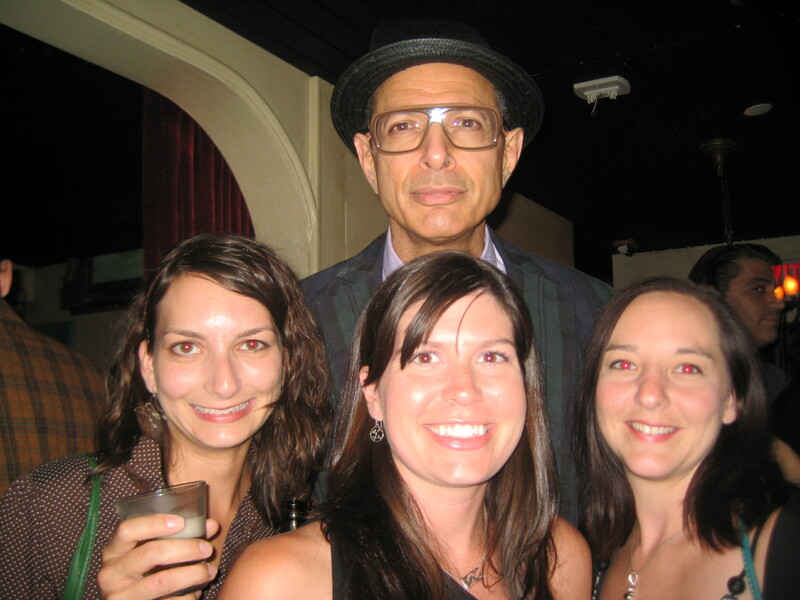 We walked into a guest only event at Cafe Was… The Jeff Goldblum jazz ensemble. yes, that is correct, Jeff Goldblum has a jazz band, and he plays piano. He is also extremely excited and animated while he is playing the piano. 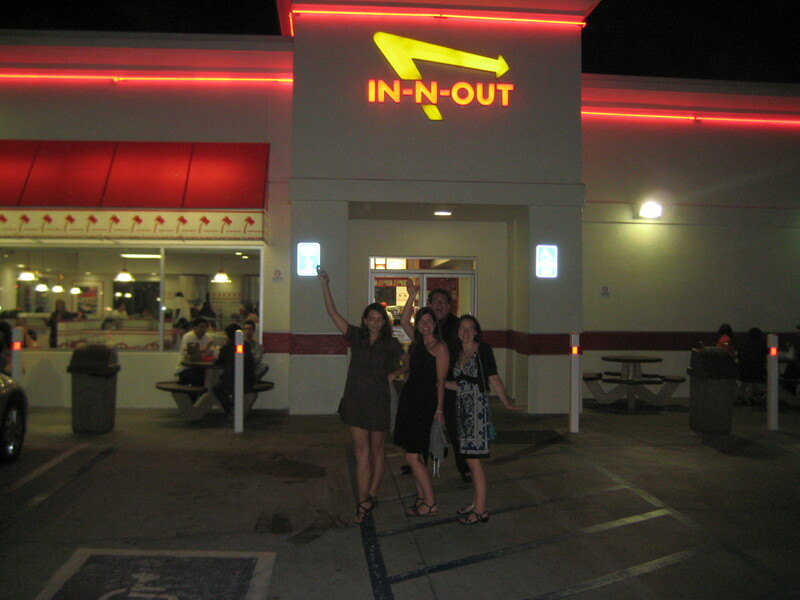 Janeen had her first In-n-Out Burger experience after the show. We went to the location in Hollywood that was packed late at night. I thought it was pretty funny that we went when we were all dressed up! We ordered a standard cheese burger with lettuce, tomato, onion, mustard, ketchup and their In-n-Out Burger sauce. While I didn’t love it, it was definitely better than the Whopper/Big Mac. It at least had a real toasted bun and way better lettuce and tomato. 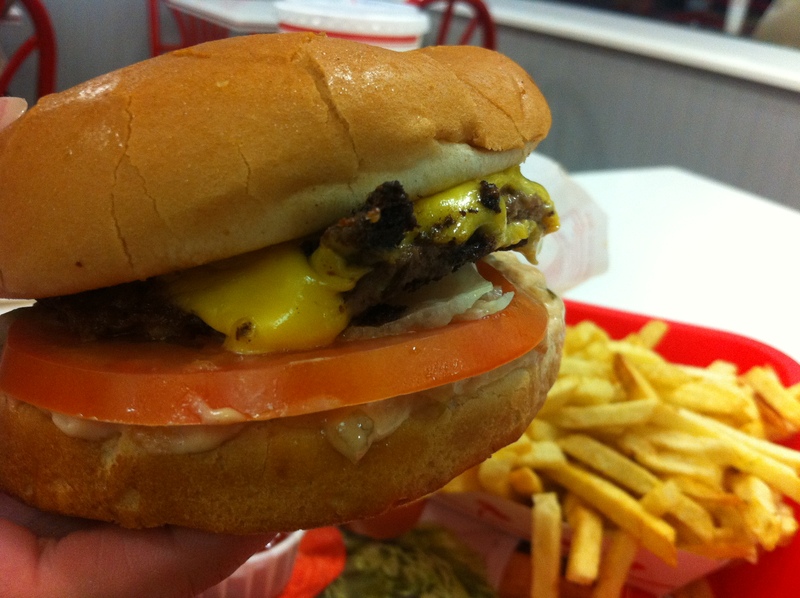 People really love In-n-Out Burger here. I don’t know how often I would eat it but I have a feeling I would stop here more then McDonald’s or Burger King, it is way better than those two places. I think we might give it another shot while we are out here and try ordering from the “secret menu” next time. Today we woke up bright and early and decided to go north to wine country. 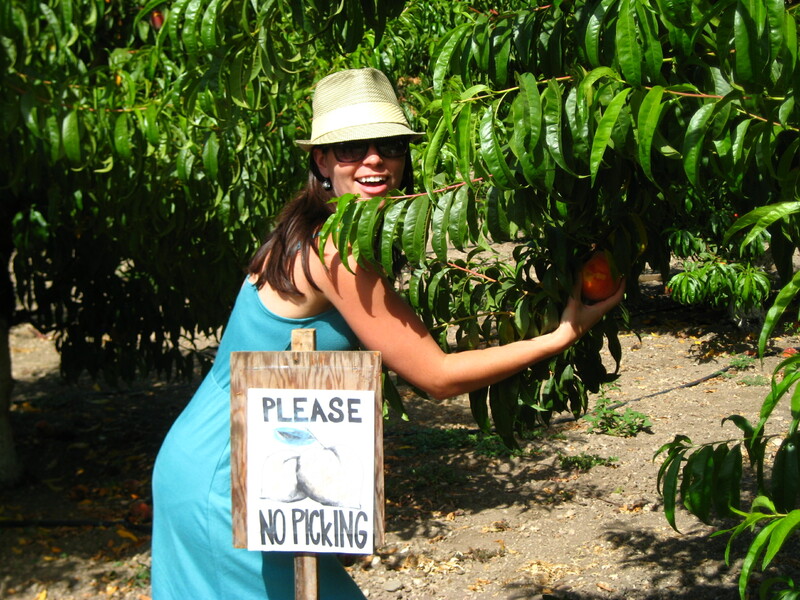 Our pick was the tiny town of Los Olivos, in the Santa Ynez Valley. 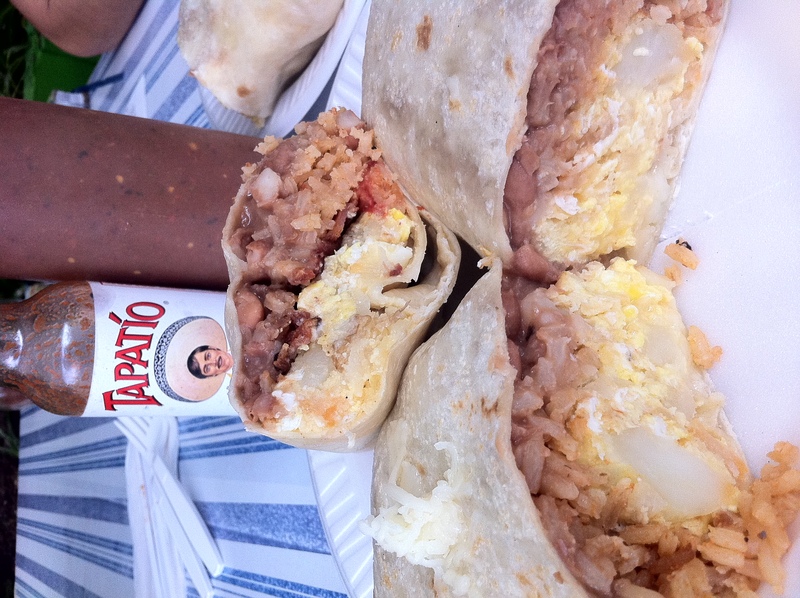 We began the morning eating Mexican Breakfast at Tacos Delta in Silver Lake. We split two burritos between the three of us because they were pretty big. We got a bacon-potato-egg-rice-bean burrito and a potato-cheese-egg-rice-bean burrito. The salsa at this place was great! It was not too spicy and it had cilantro in it, a good addition to the burritos. We grabbed a coffee at Casbah Cafe. I had an iced coffee (which was excellent). The shop was really colorful inside and all of the pastries and foods were carefully set up with care to look beautiful. 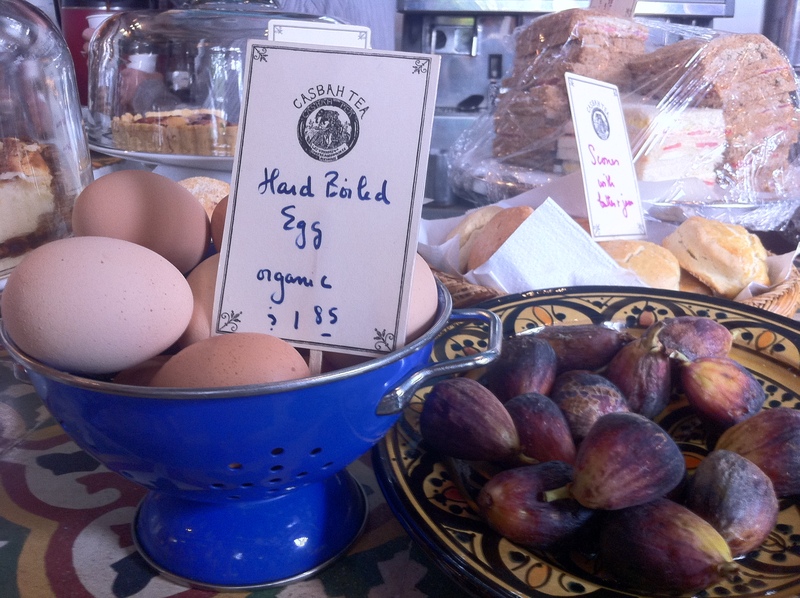 I loved that they had nice brown hard boiled eggs on the counter top and fresh figs. We stopped in a small beach town called Summerland and walked into a cafe with lots of lawn ornaments and a nice front porch called Cafe Luna. 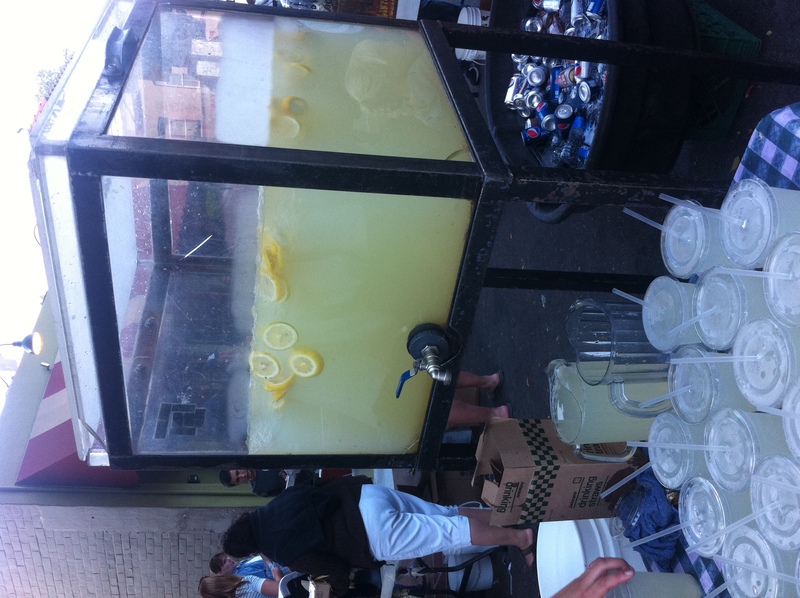 I am mentioning this place because I thought it was really cool that they had home-brewed Kombucha tea. There’s only one girl that knows how to brew it that works there. Unfortunately, she was on her own vacation and their Kombucha supply ran dry until she gets back. 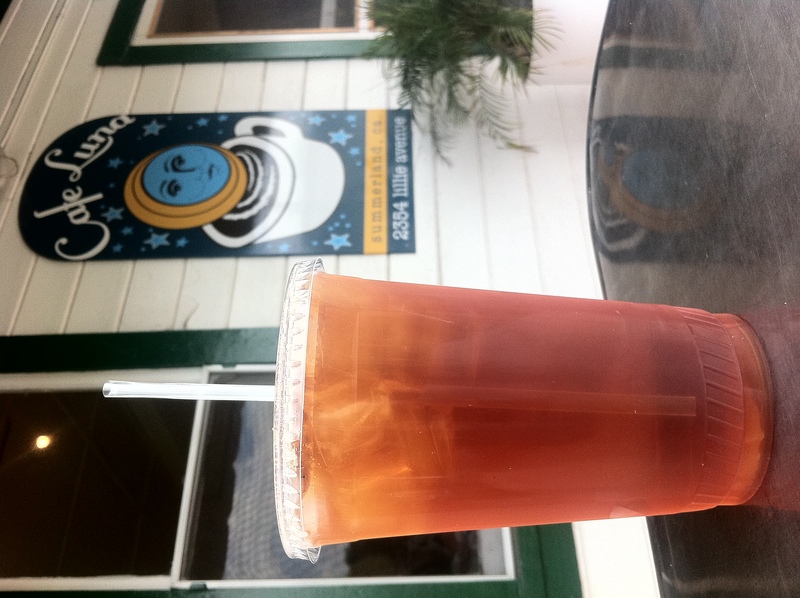 We all got their standard black iced tea. It had a nice clean and slightly sweet flavor (it was unsweetened though) and you didn’t have to add anything to it. It was perfect just how it was. Next stop, Los Olivos. The drive up was mostly highway that ran through beautiful hills next to the coast then we had to turn inland. 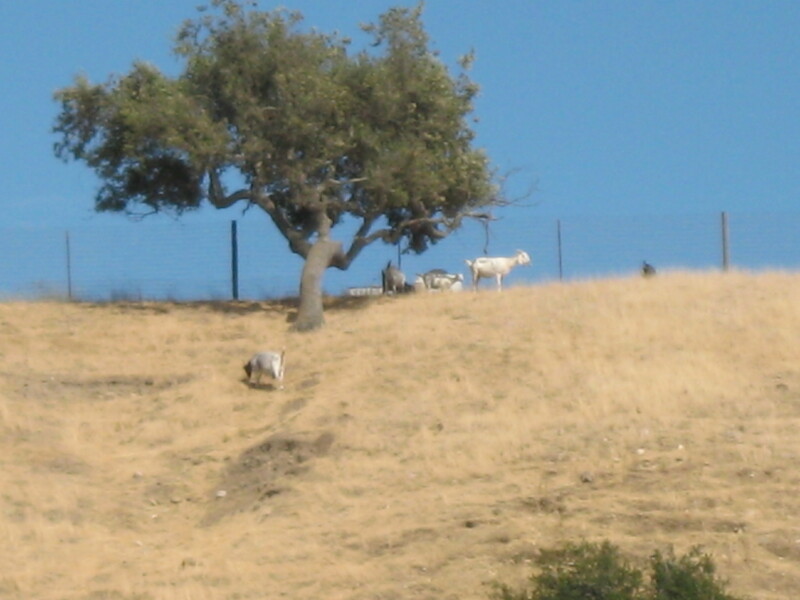 We drove amongst golden grassy hills with wiry oak trees that looked like they grew slightly tilted from the wind. Los Olivos was quaint. 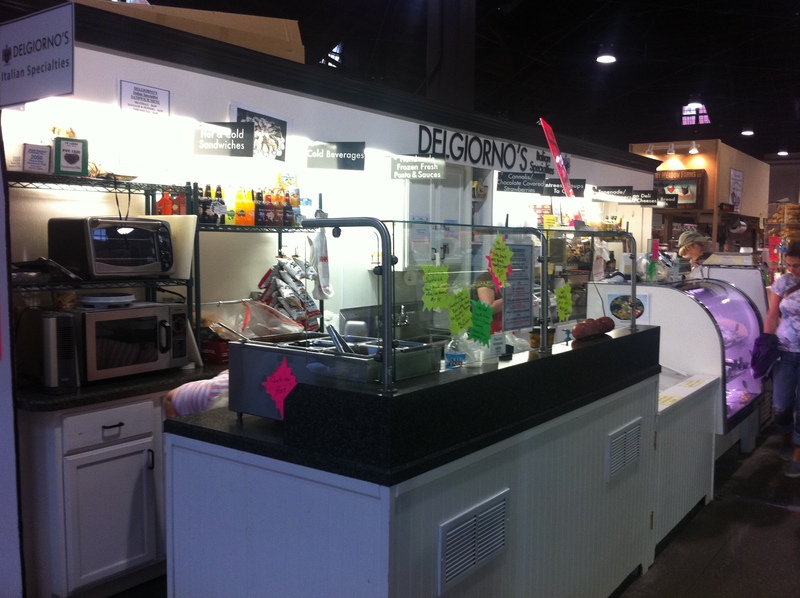 It had one market, one coffee shop, and numerous wine tasting rooms from the surrounding vineyards and farms. 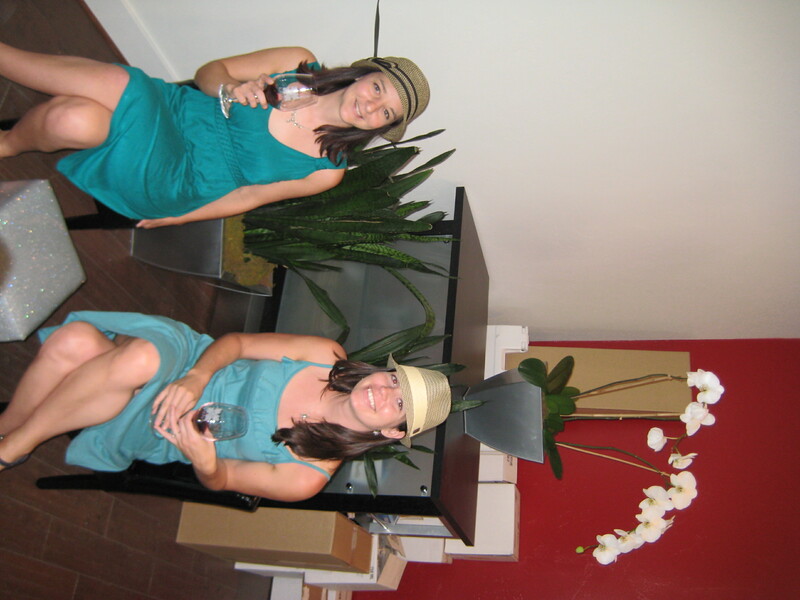 We stopped at Andrew Murray Vineyards, Blair Fox, and Kaena wine tasting rooms. I can’t even pretend to know exactly what I am talking about when it comes to wine. I do love tasting them though and I think I learned a lot about wine just in one day! Andrew Murray wines were my favorite. I realized here that I actually like white wine. We tried a Viognier (which I have never had) that was delicious and fruity and seemed perfect for a hot day. I learned pretty quick that I really like the blended wines. I ended up getting one from here called Eleven, a blend of grenache, cabernet and syrah. It is a reference to Spinal Tap and the amplifier that can crank the volume to Eleven. 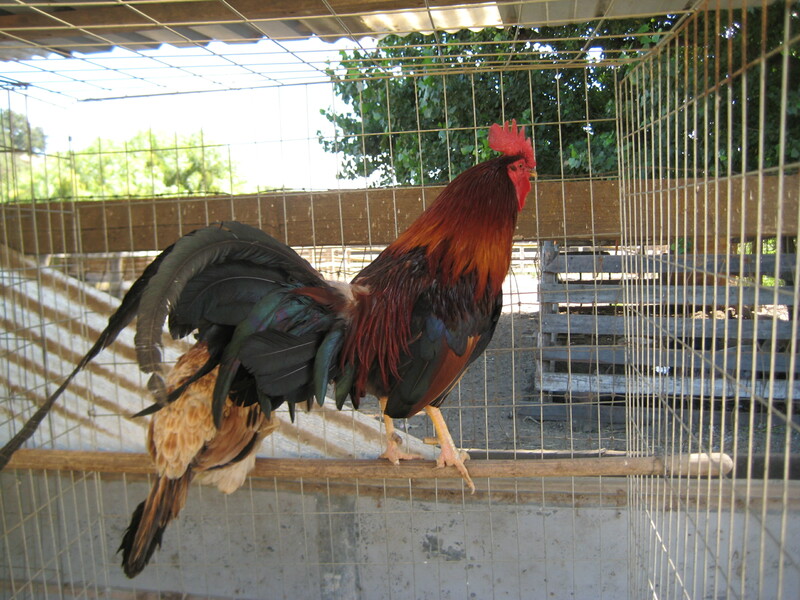 The one thing that really stuck out at Blair Fox vineyard is that their wine was very earthy. It was like you could taste the differences in the dirt the grapes were grown in. 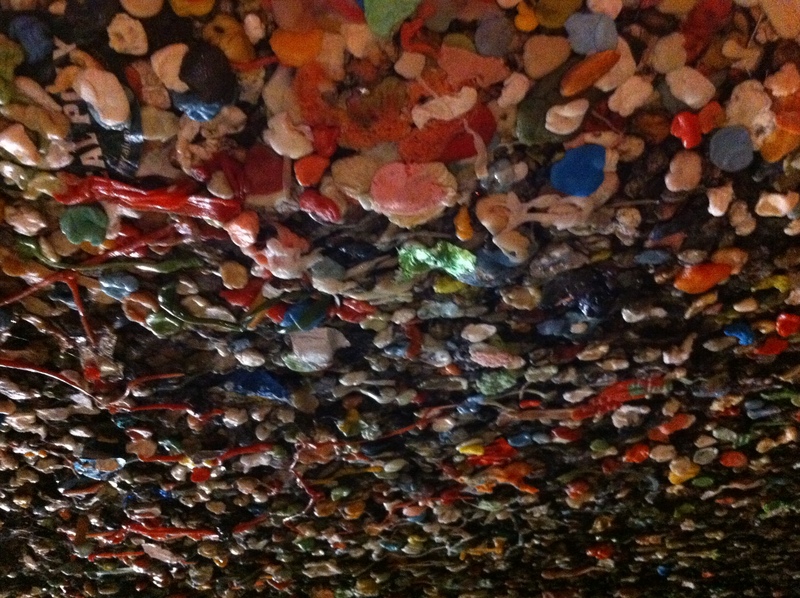 It made me notice different flavors and definitely remember them. There was one white wine at Kaena that had a creamy, smooth, fruity flavor to it. It is called Hapa Blanc, a blend of grenache blanc and roussanne. I like it so much that I bought a bottle to take home with me. One thing that I will take away from this wine experience is that I learned I like good white wine. White wine (any kind) isn’t my favorite, but I now realize I was probably just drinking some very low quality ones. We had to start heading back to LA after Buttonwood and we had to get some dinner. 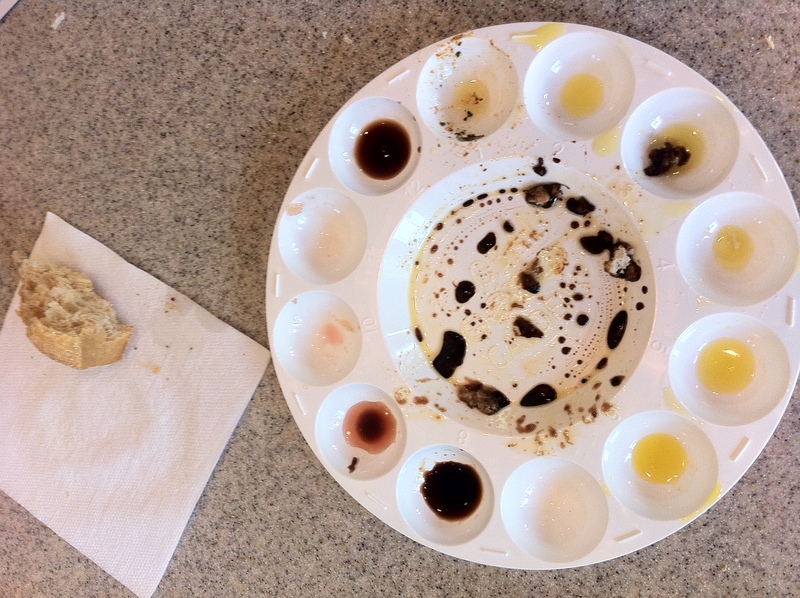 Tasting all that wine made us work up an appetite…. We tried to find this place called Cold Spring Tavern… and what a find it was! We took a winding desolate road for a while and just as we thought we went the wrong way, we see all cars lining the skinny roadway on both sides. This place was an oasis in the dry hills, and it was packed! It was part dining room, part biker bar, part BBQ pit, with shacks in the woods from the stage coach era. 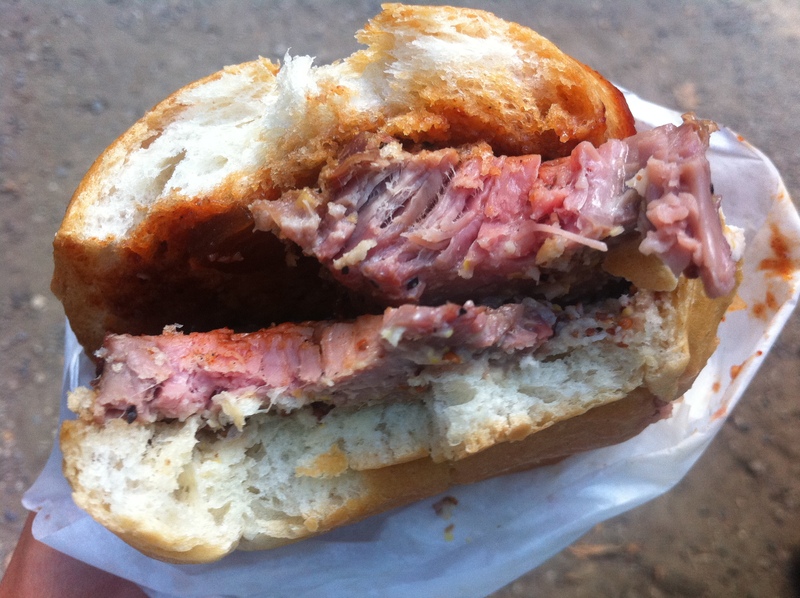 We went for the beef tri-tip sandwiches. You had to go in to the bar to purchase a ticket, then go outside to the BBQ pit to get your giant sandwiches from a big burly Mexican guy. 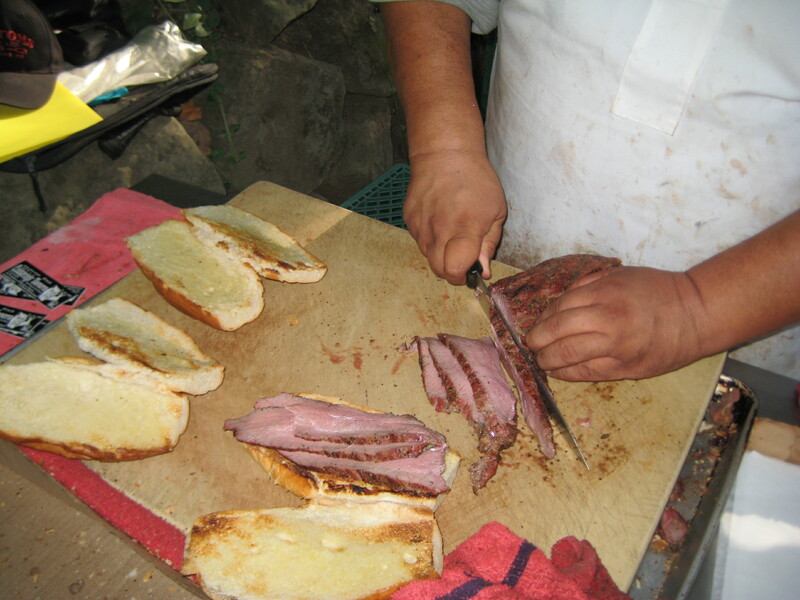 He took a giant hunk of meat off the grill and sliced it up for the three of us, placed it on grilled bread, handed over the sandwiches and told us to squish it all together. Erin asked him how he eats it and his reply was “horseradish and salsa.” I chose the barbeque sauce and horseradish sauce on mine. It was so big, I couldn’t eat it all. I am definitely not used to eating that much meat all in one sitting. It filled me up for the rest of the night. We made our way back to Los Angeles through stretches of traffic. We stopped in at a party at The Park restaurant, where Erin works. Then we headed into Hollywood for a comedy show. All-in-all a great day in CA!